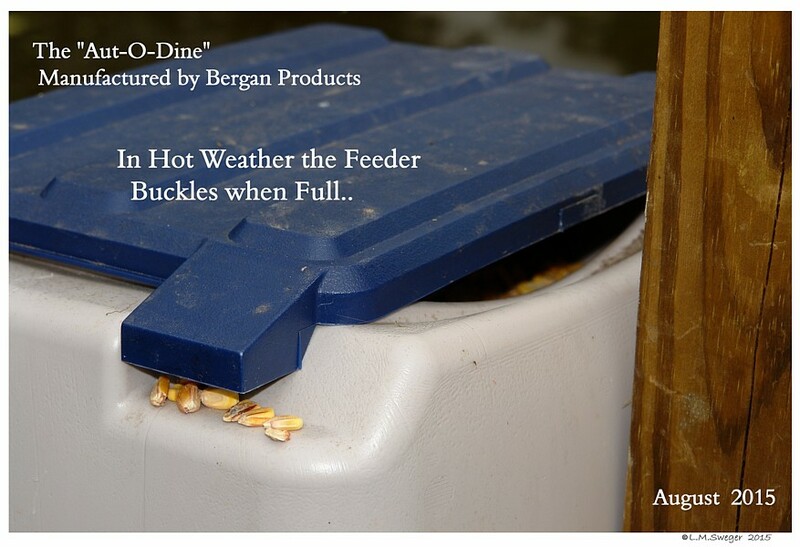 For a while these Feeders were made by Bergan Pet Products.. 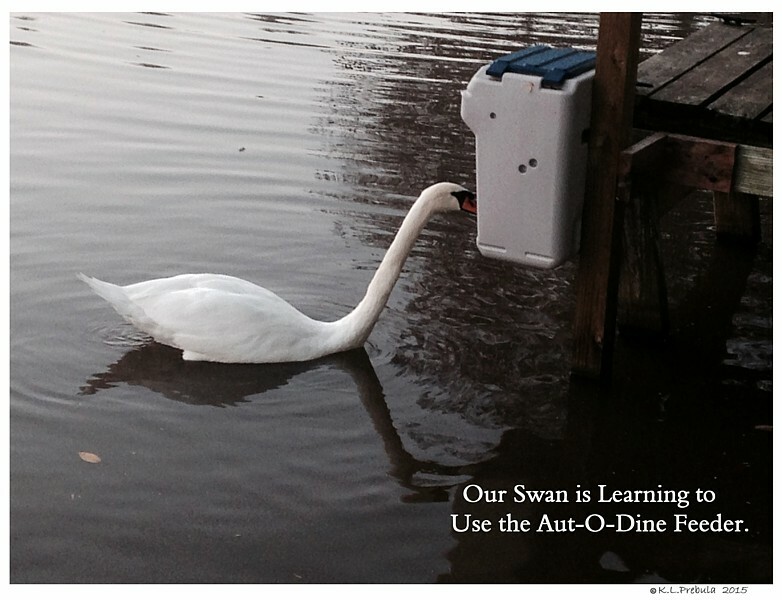 They were Renamed the “Aut-O-Dine 25” – for the Capacity. 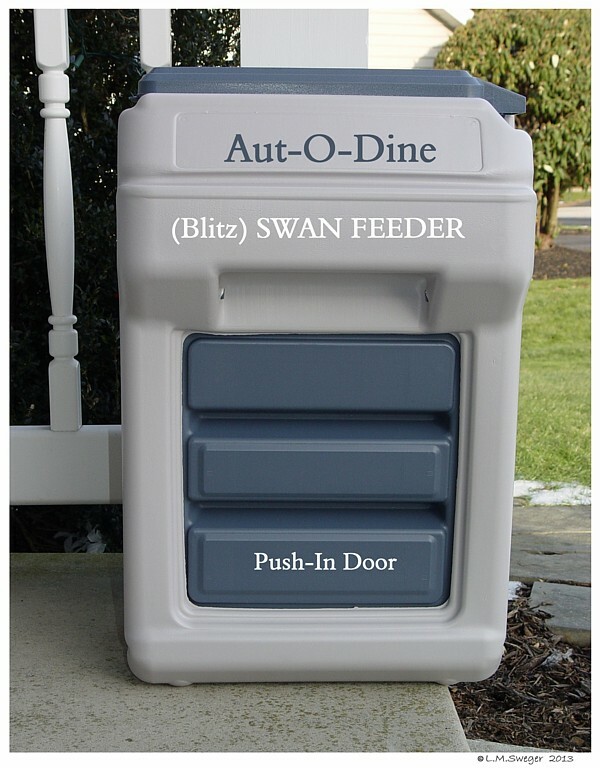 Now Aut-O-Dine 25 Feeders are made by Coastal Pet Products. We have had LOTs of Exposure to and Experience with these. 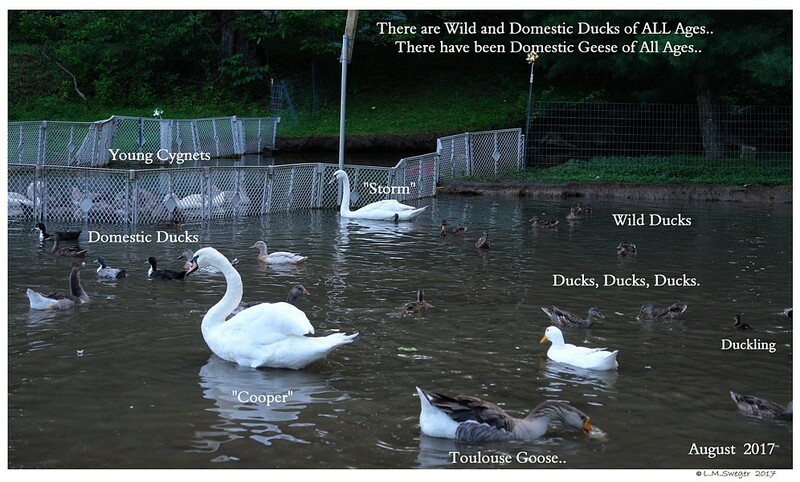 They are used by maybe 8-10 Swan Ponds we know or Visit.. 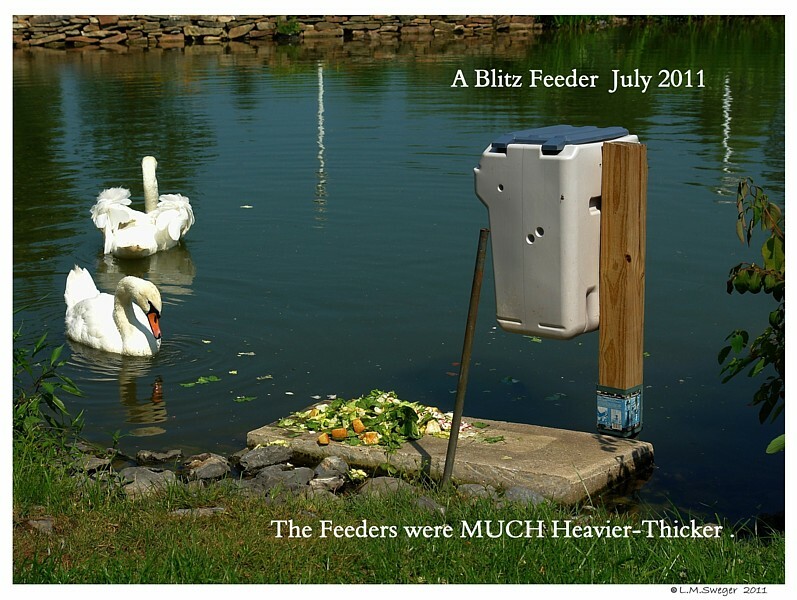 The Aut-O-Dine 25 – (Blitz Feeder) as used for Swans. This is a GREAT Idea, that has some Design Flaws. 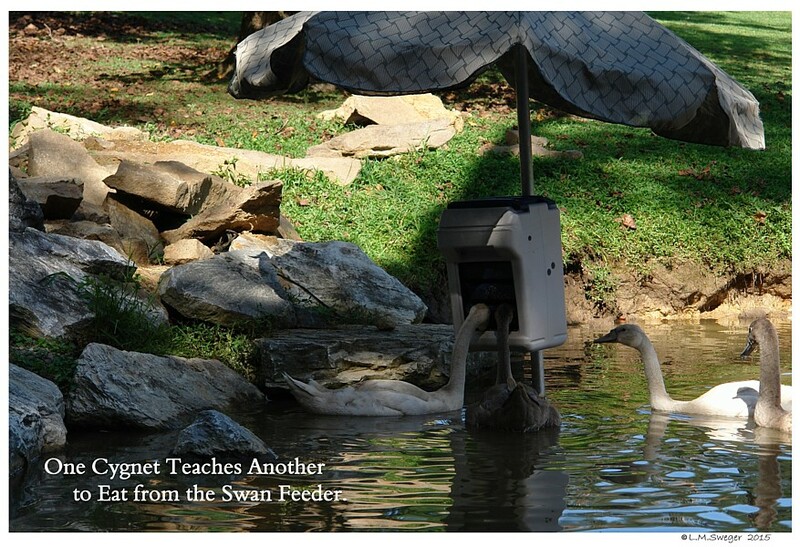 Because they are Dog Feeders Adapted for Swans. some of the Problems we have experienced – Great. The Basic Design is very similar.. 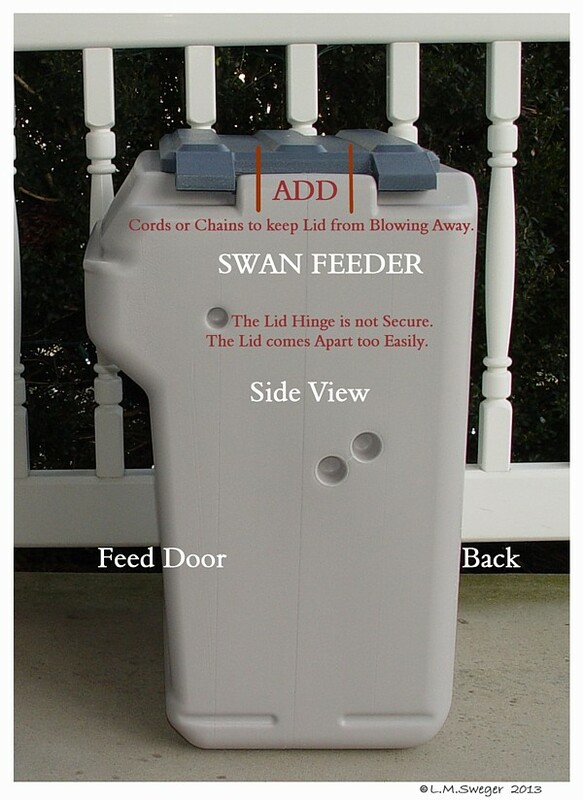 I am adding Notes on the use of this Feeder all the time.. I WISH these were as Wonderful as they seem.. But, until there is a better alternative.. many try to adapt. 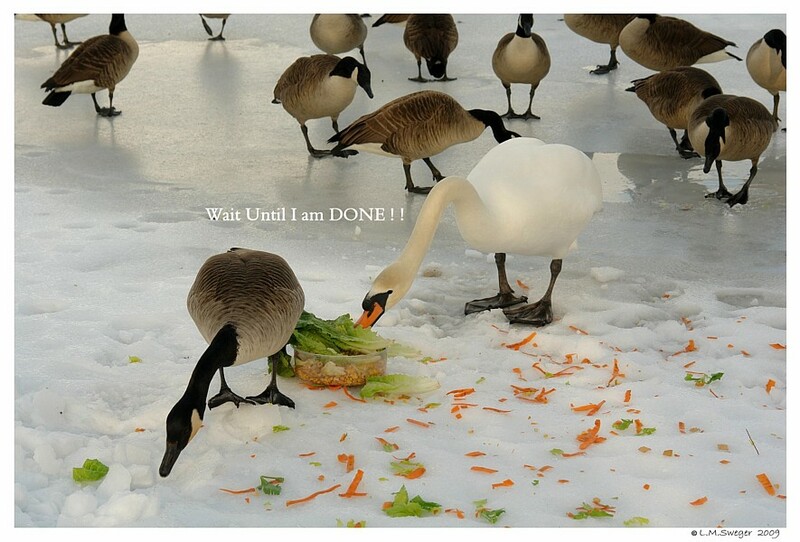 Swans NEED a Different Diet then Ducks and Geese. 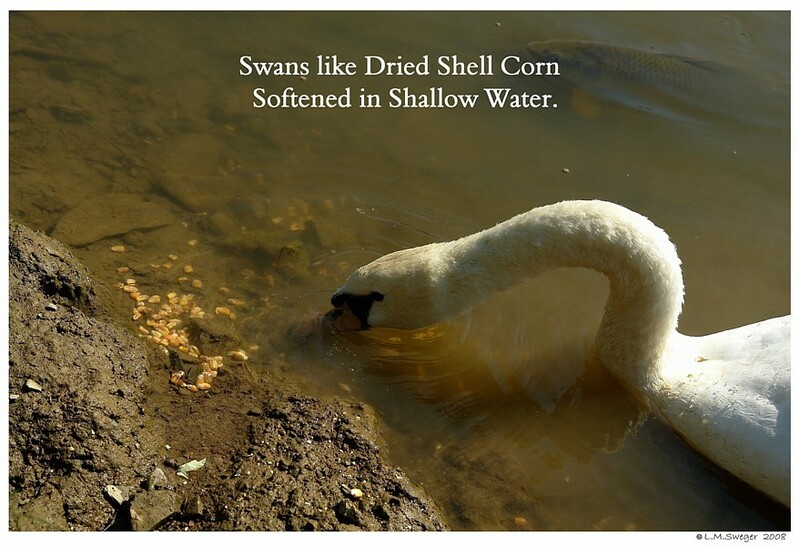 Swans Should NOT have a HIGH Protein Diet. 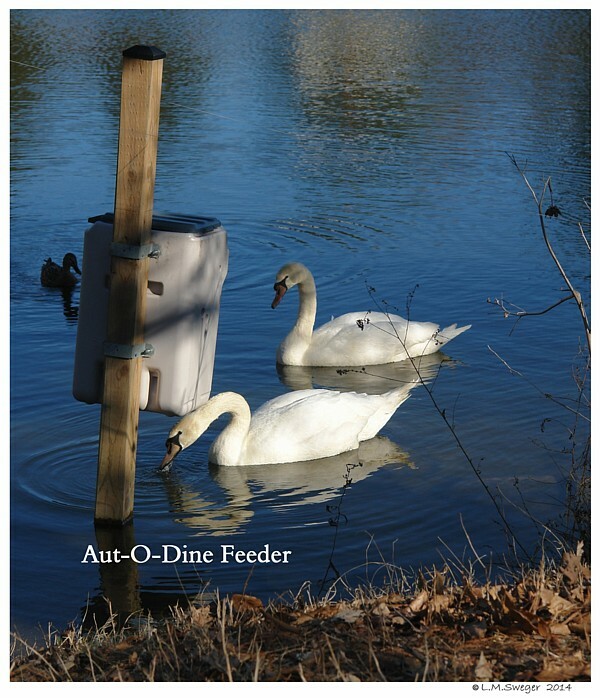 you NEED a Way to Provide your Swans a Healthy Feed Mixture. 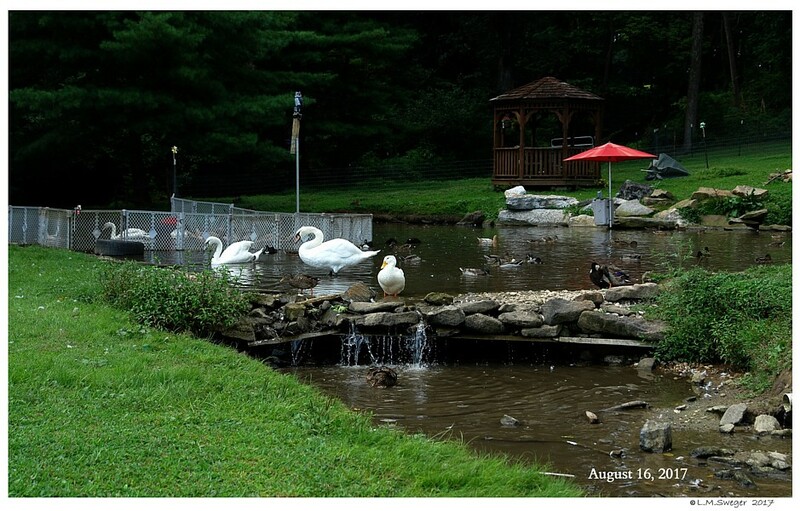 A Pond with Assorted Domestic Ducks, Geese and Swans. 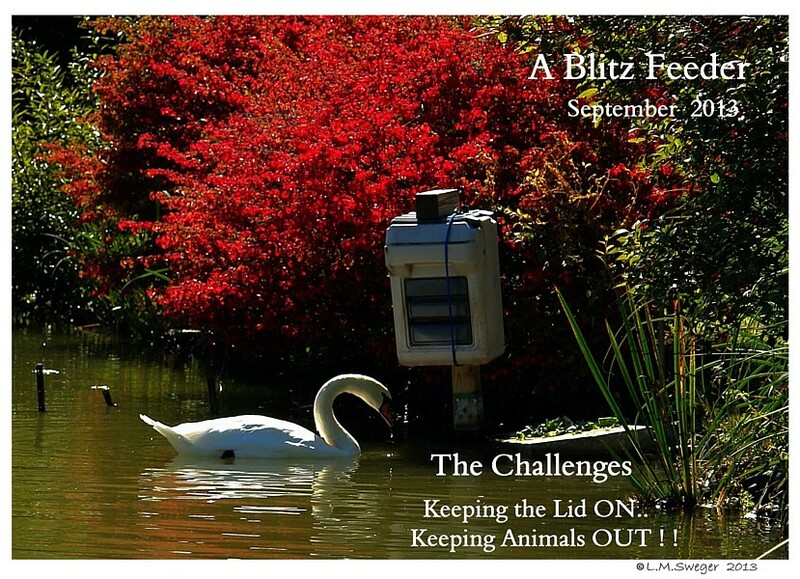 SLOWLY Graze and Enjoy their Feed Mixture and Food Items..
Finding Another Way to Feed them would not be Necessary. 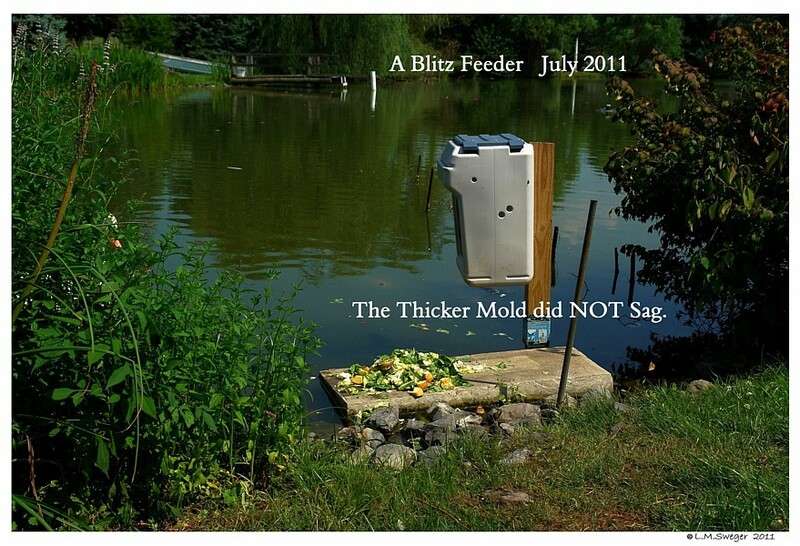 These Feeders were not Meant to be Outside in the Weather. This is a Semi-Permanent Mount. More Work to Move. 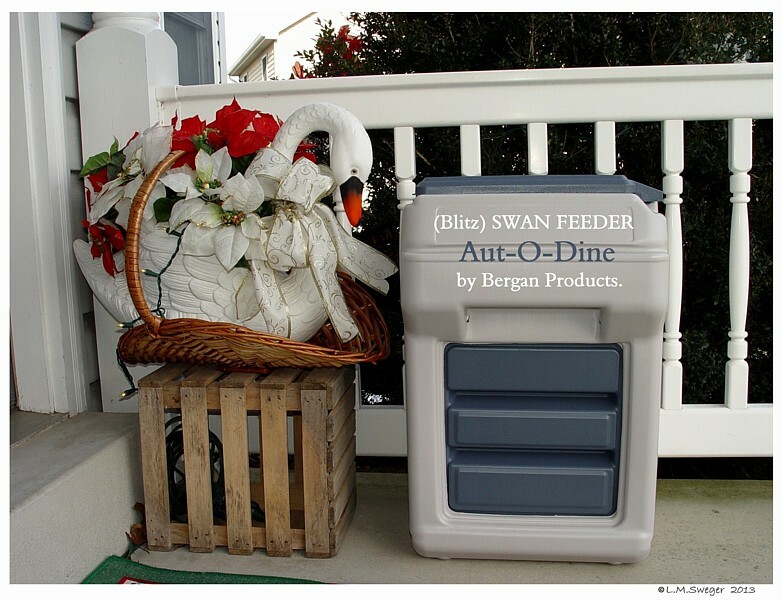 Keep Feed Mixture Dry during Summer Months.. Less Spoilage. 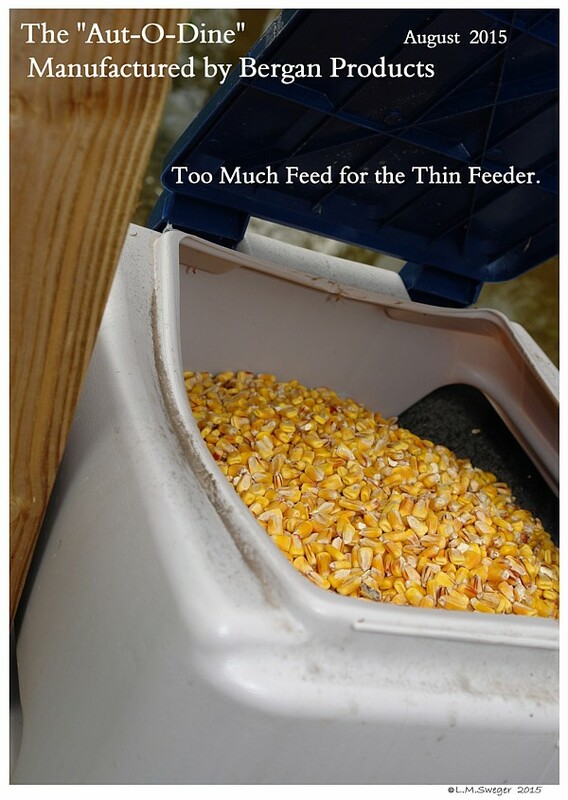 Keep Rodents out of the Feed Mixture. a Snack Bowl. Animal Saliva and POOP carry Diseases. 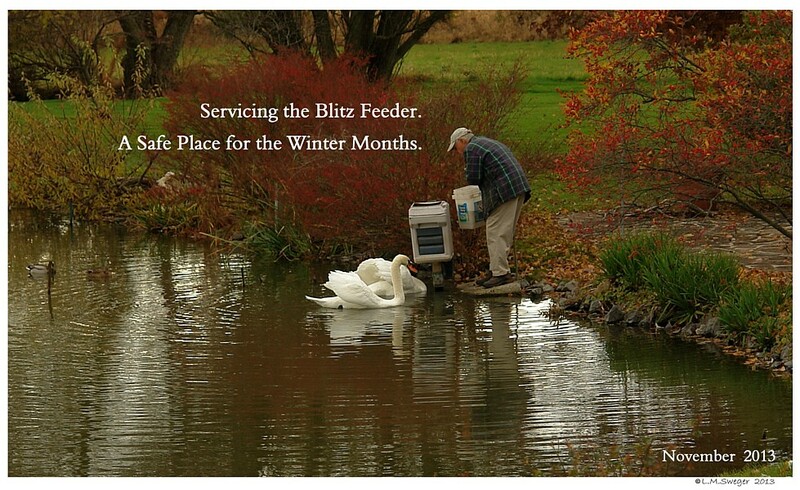 Keep Feed Mixture from Freezing during Damp Winter Months. 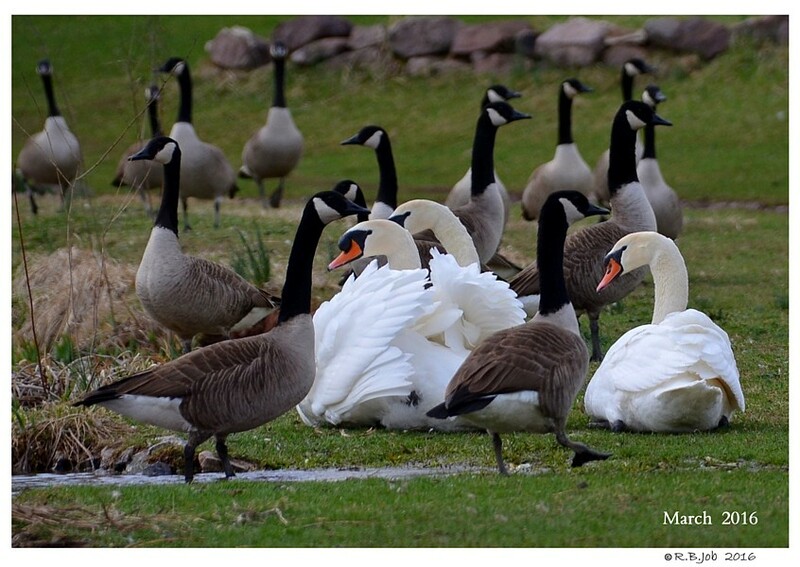 Keep Geese and Ducks from Raiding your Swans’ Feed. 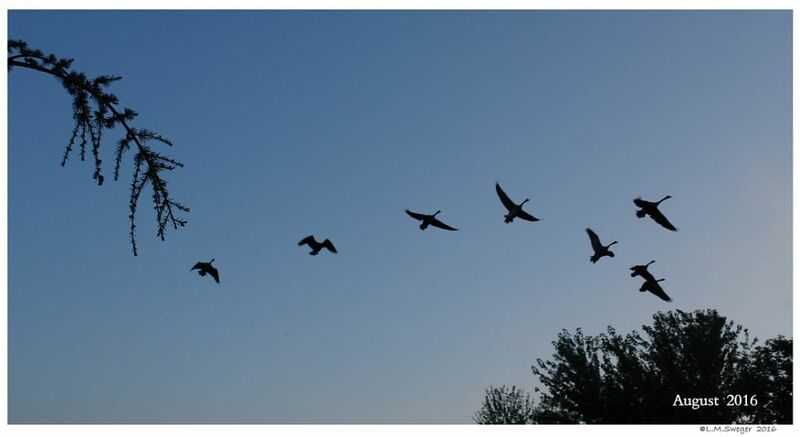 Ducks and Geese are Gobblers.. they EAT Quickly and Move on. 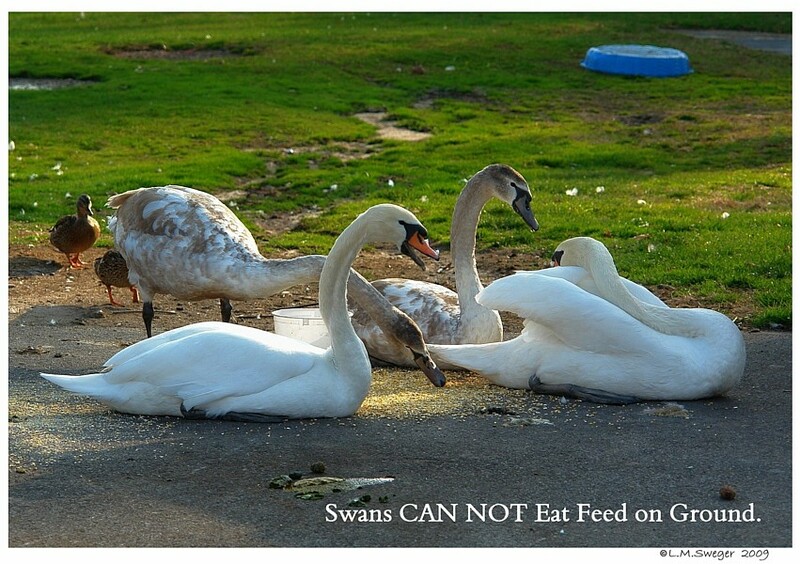 Swans are Grazer. 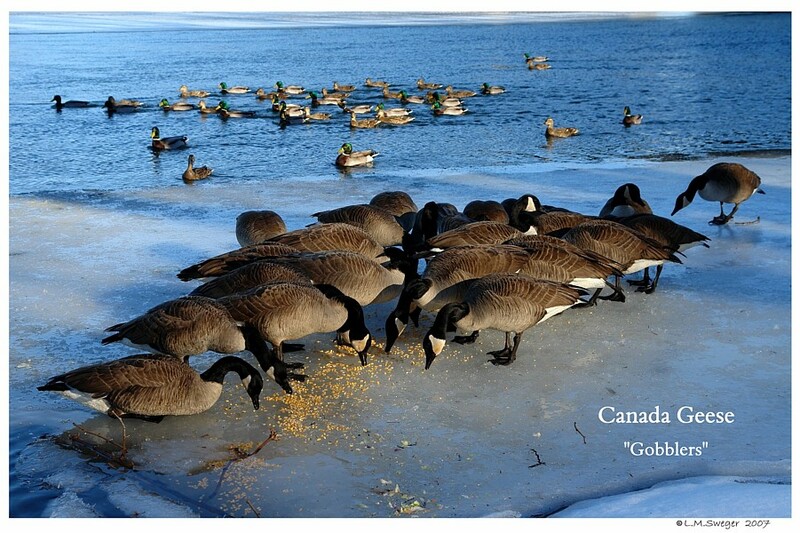 They Like to Eat Slowly – Nibbling All Day. Available all through the Day Light Hours. 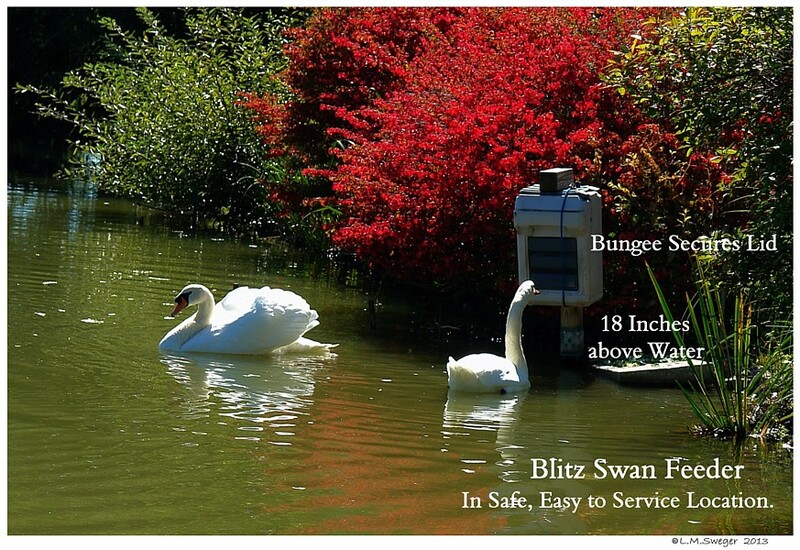 Works Best Mounted 15-18 Inches above Shallow Water. 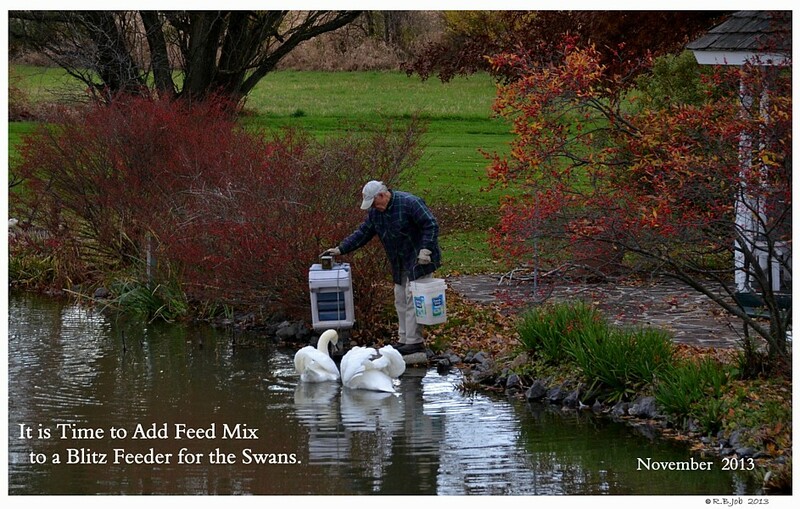 Swans will Drop Part of the Dry Feed Mixture as they Eat. 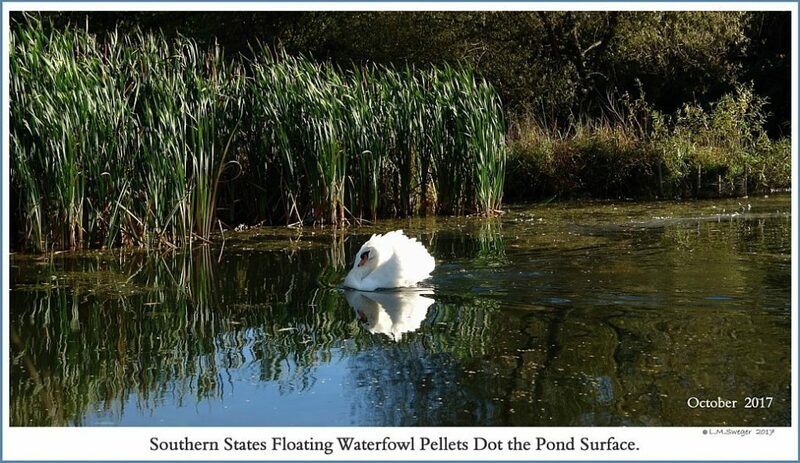 Having Floating Pellets as Part of Mixture the Swans will be Able to Graze on them. 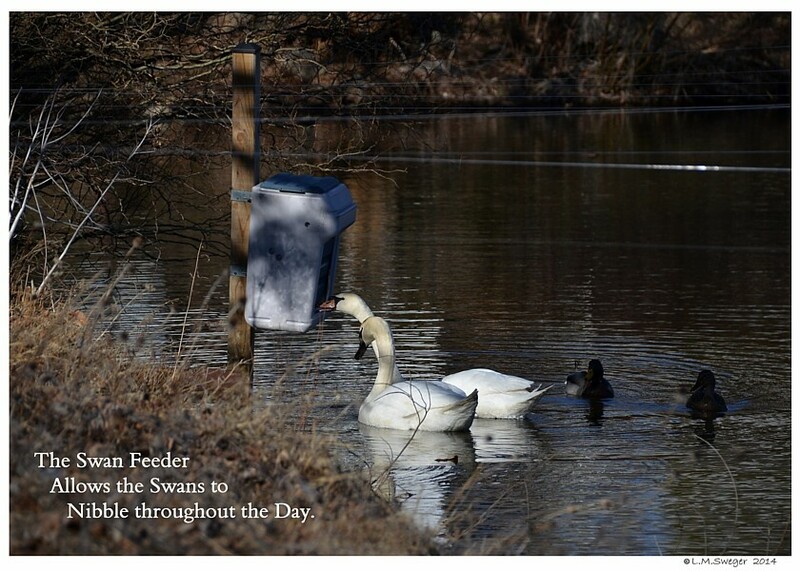 It is BEST to Feed your Swans in the Water. 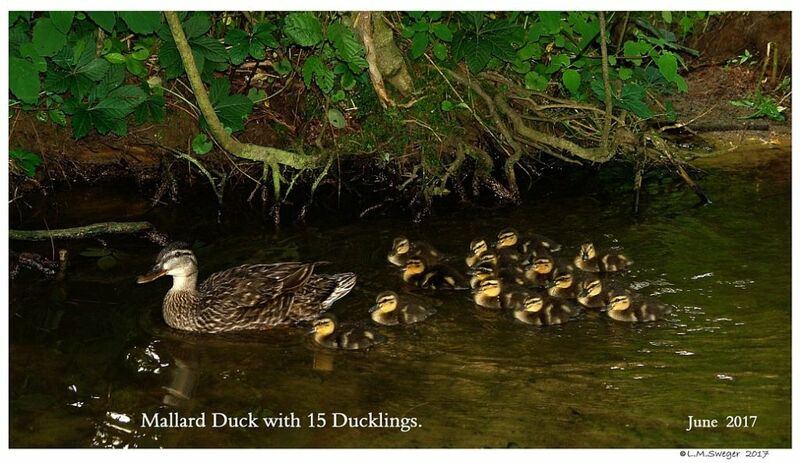 They are Safer from being Stalked and Grabbed by a Predator..
…So Ducks and Geese can not. 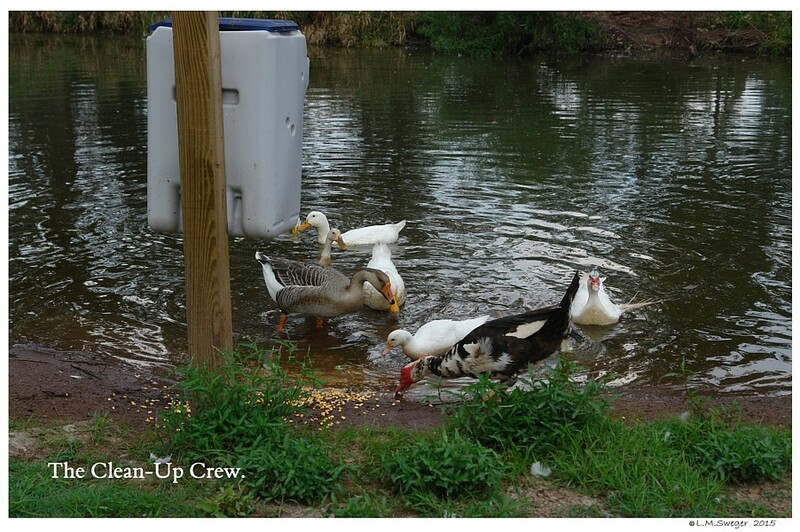 The Ducks and Geese will Happily Clean-up Dropped Feed. 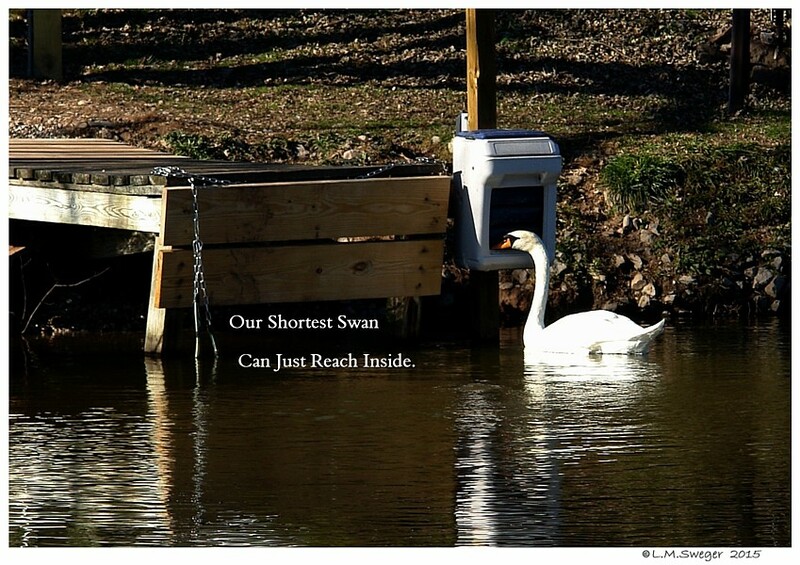 You want the Shortest Swan/Cygnet to be able to reach. 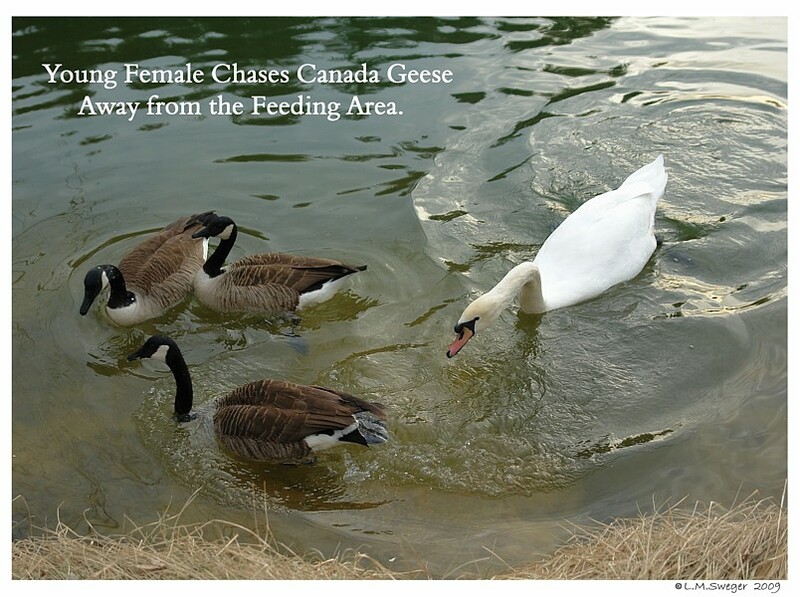 Discourage them from Hanging Around your Pond. 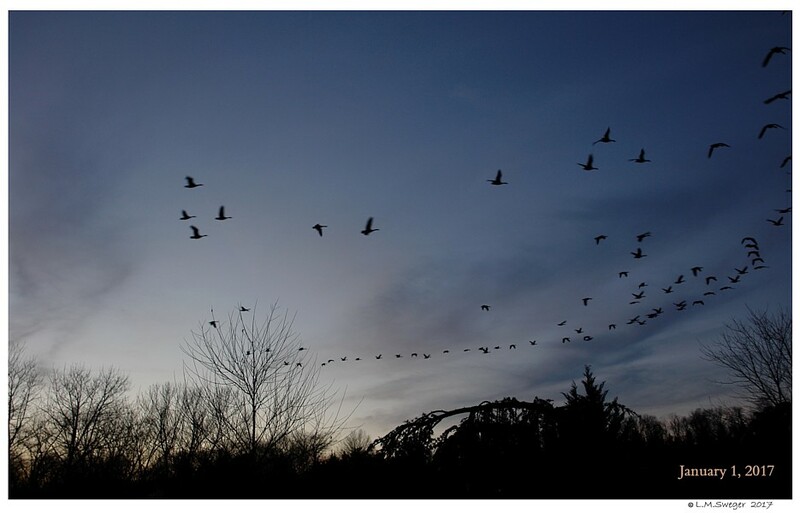 This may be a Temporary Problem during Annual Migration Seasons. 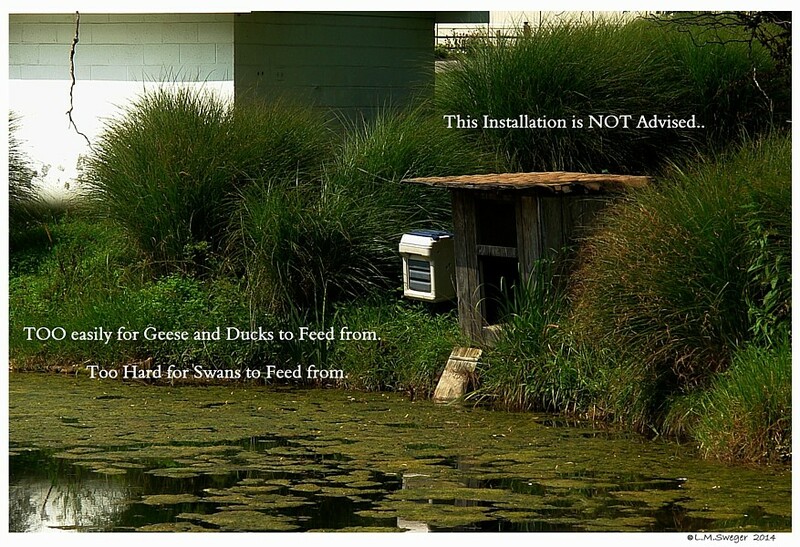 You will NOT be Feeding ALL the Wild WaterFowl. 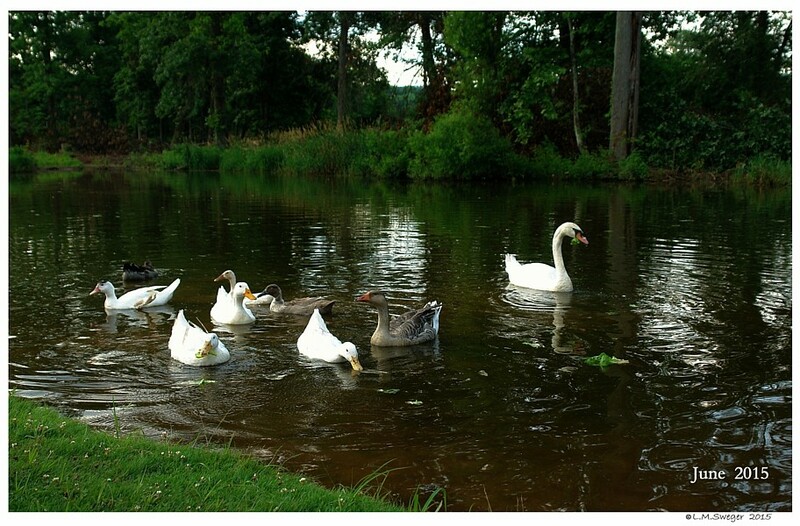 We often see the Swans trying to Chase the Geese away from their Food. 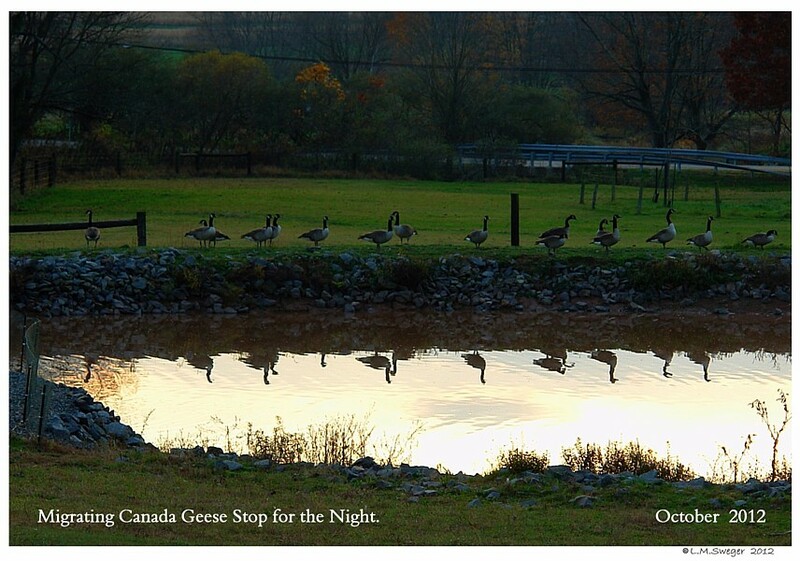 The Geese tend to Distract and Divide.. Sneaking in from Different Directions Grabbing the Food. 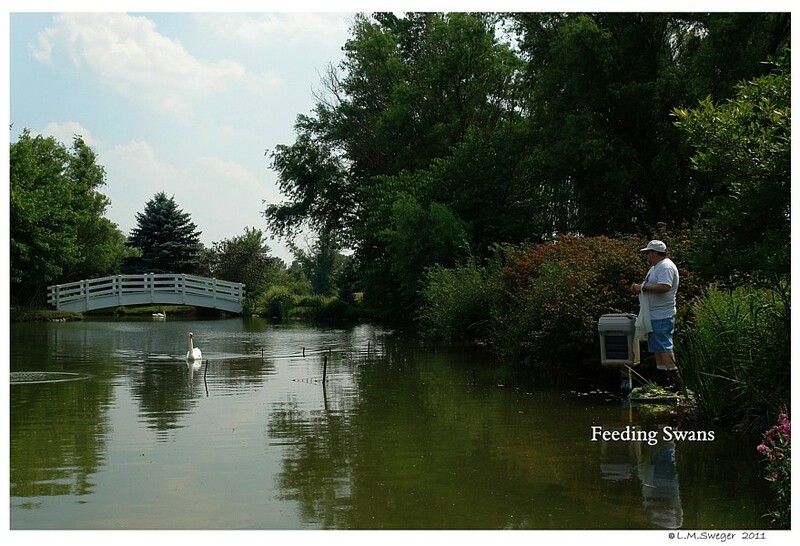 After a Short Time the Food-Feed is all Gone and the Swans did not get to Eat. 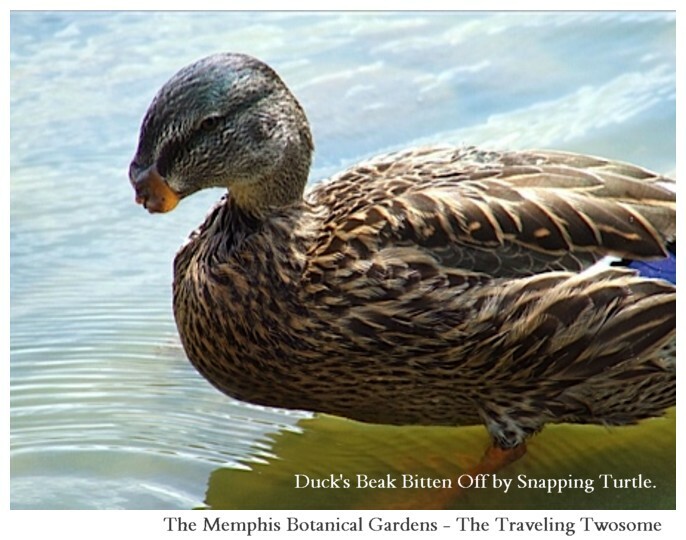 may Carry Diseases to your Pond. Best if they just keep Moving to their Far Off Destinations. 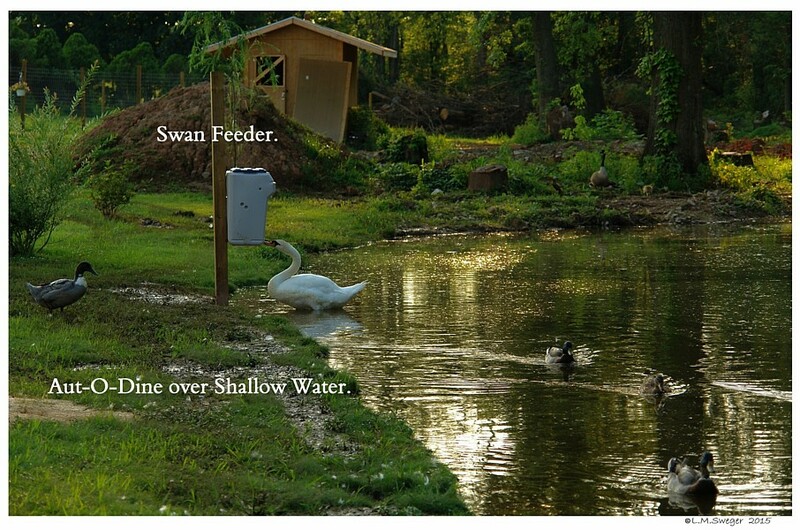 Putting Feed on the Ground is Difficult for Swans to Pick-up. 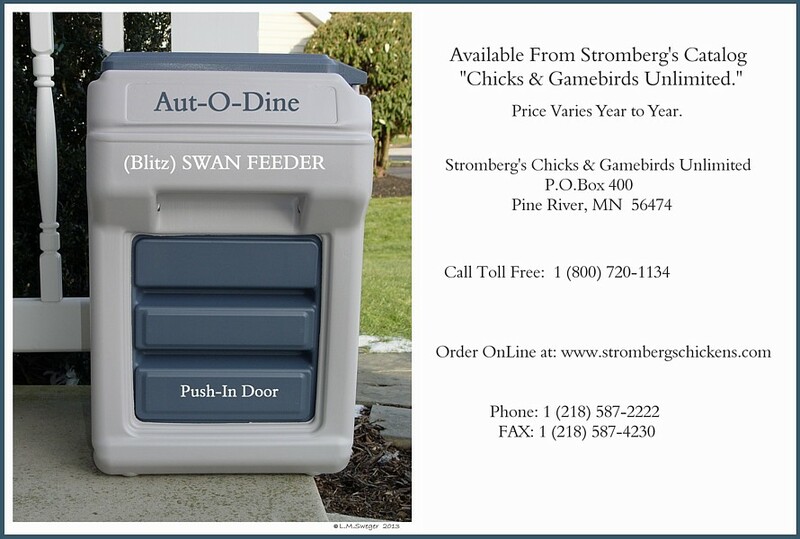 Plus they may “Choke” on Dry Feeds without Water Available. 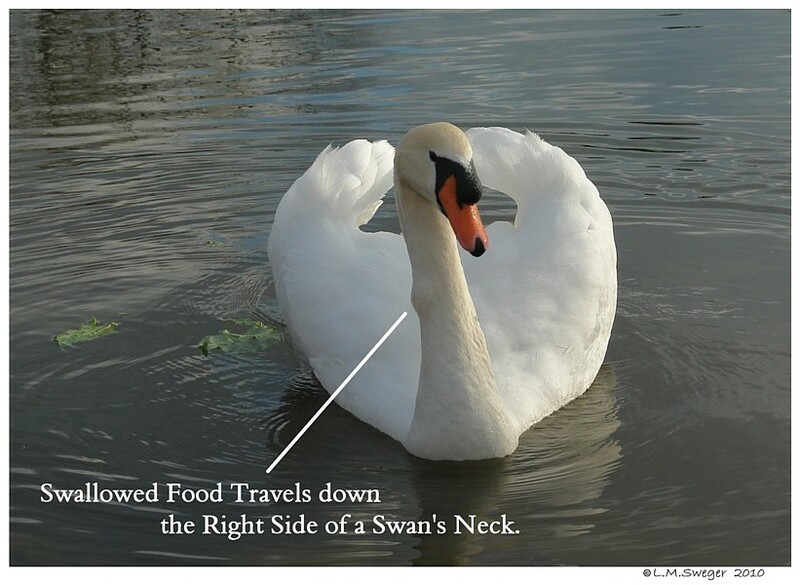 NOTE: If a Swan tries to Eat TOO Fast..
in their Esophagus and Block Swallowing. 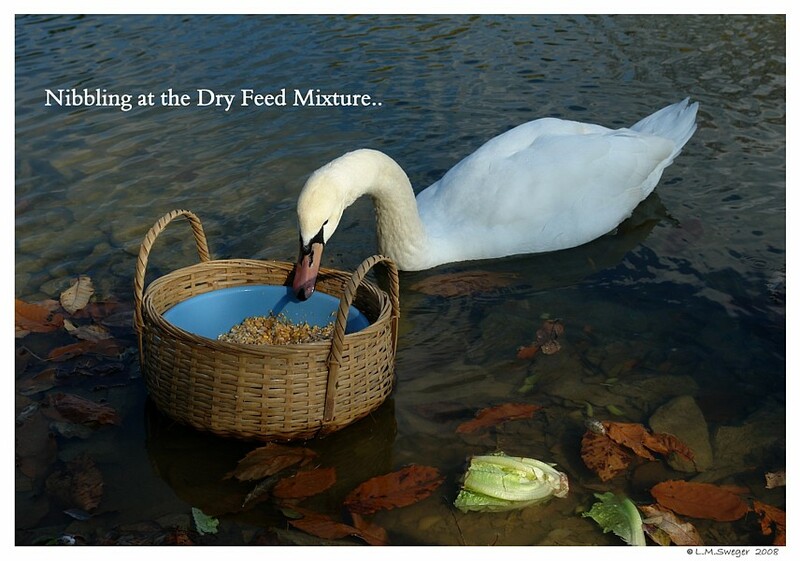 Supply Water with DRY Feed Mixtures. 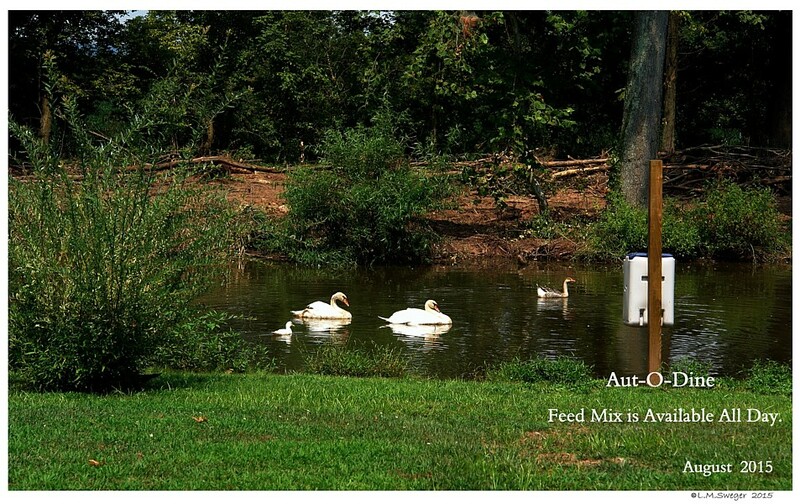 Having Feed Mixture in a Contain is Better for them. 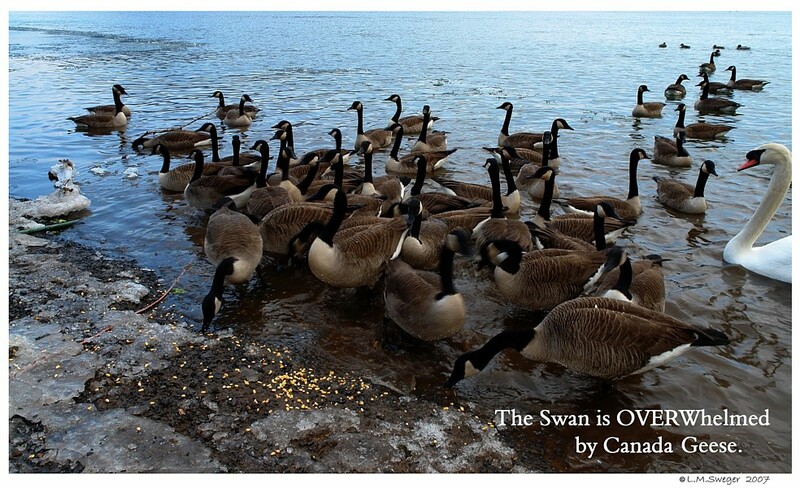 Grabby Ducks and Geese will OverWhelm the Swans. 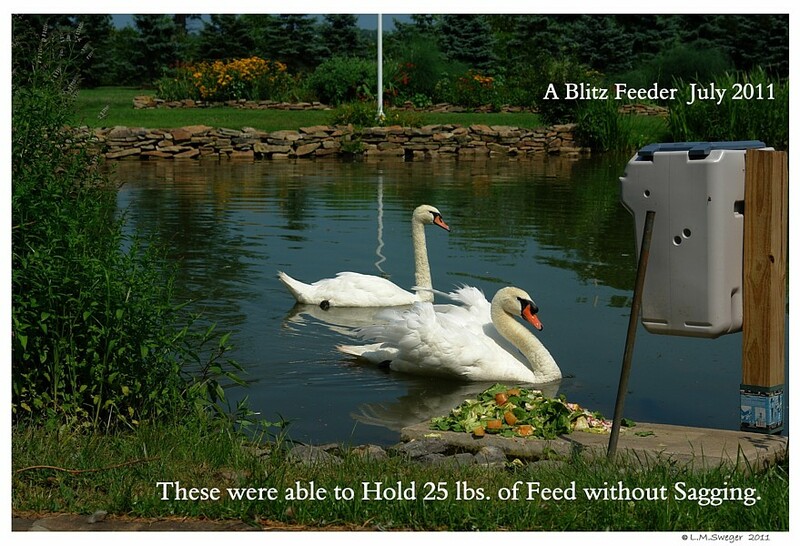 Feeding Your Swans may take some Imagination so the Swans get ALL the Nutrients and Calories they Need. 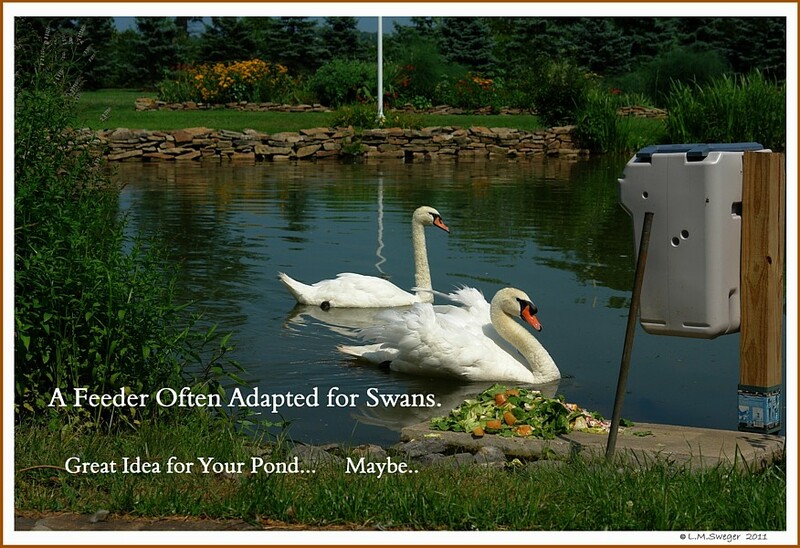 Try Different Methods until you Find the One/Ones that Work the BEST for Your Swans. Consider the most Common Direction of the Rain in your Location. Try to Place in a Semi-Shady Place. Check the EDGE of the Push Door for Rough Spots.. 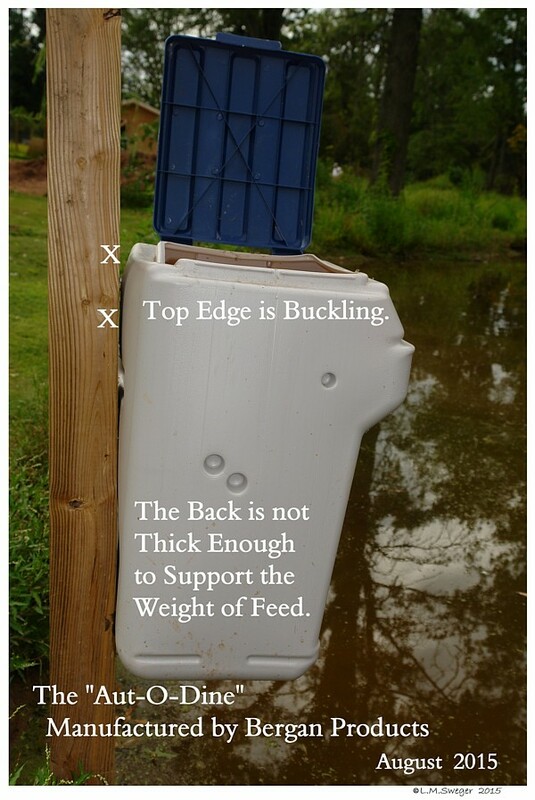 Check the EDGE of the Feed Tray for Rough Spots. An Emory Board will Smooth any Sharp Spots. 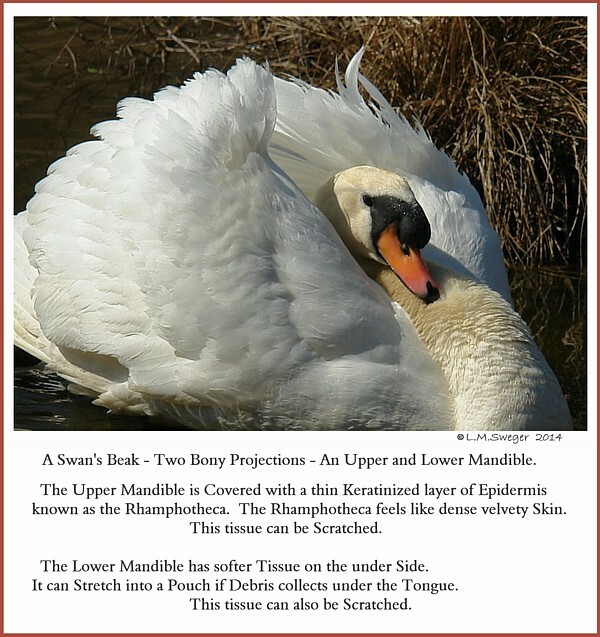 A Swan’s Beak is covered by a Dense Skin.. it Scratches. It is not a HARD Horn like Surface. Mounted on a Round Pole makes it easier to Adjust the Height..
And Move the Unit from Left to Right. BUT it is Difficult to Reinforce the Back on a Round Pole. 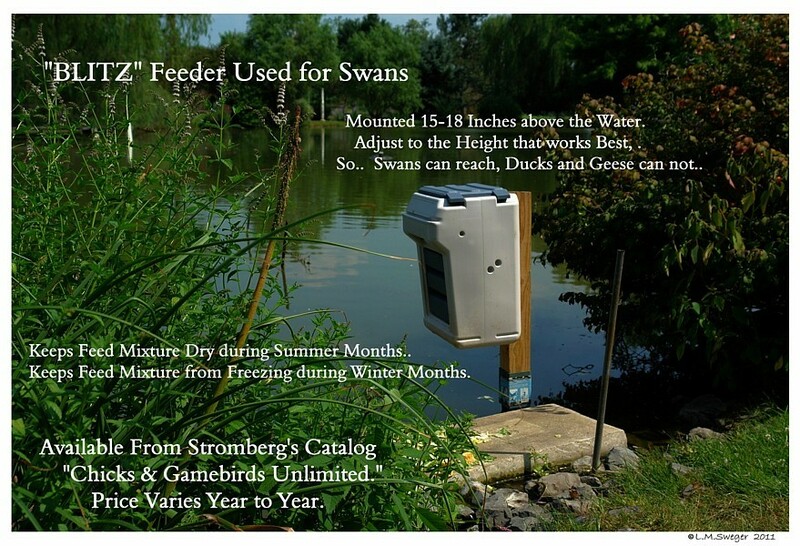 during Wet Weather and the Water Level Drops during Dry Summer Months, you may want to Adjust the Feeder’s Height. Not as easy to Adjust Height – more Permanent. 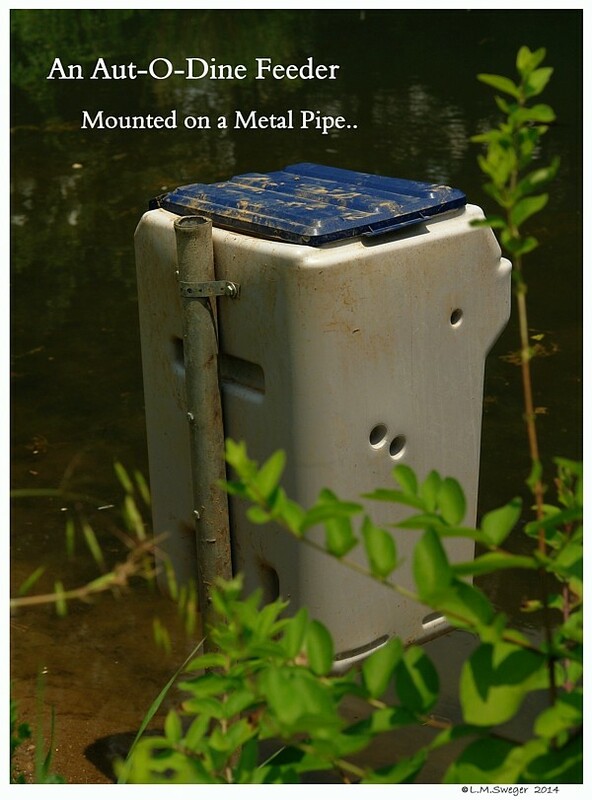 Mounted to a Solid Structure more Stable.. The Push Door Works Better. On a Square Post Something can be put inside to help Support the Back of the Container to keep it from Sagging when Filled.. 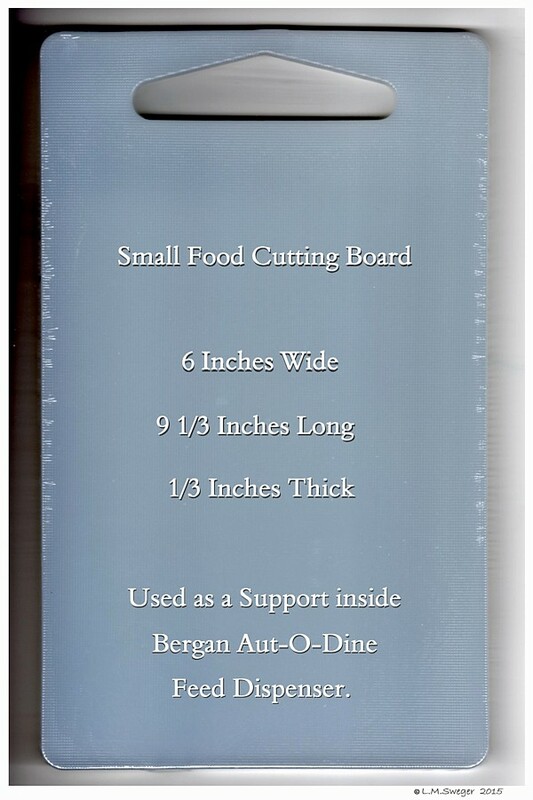 I used a 6 x 10 x 3/4 inch Poly Vinyl Cutting Board. 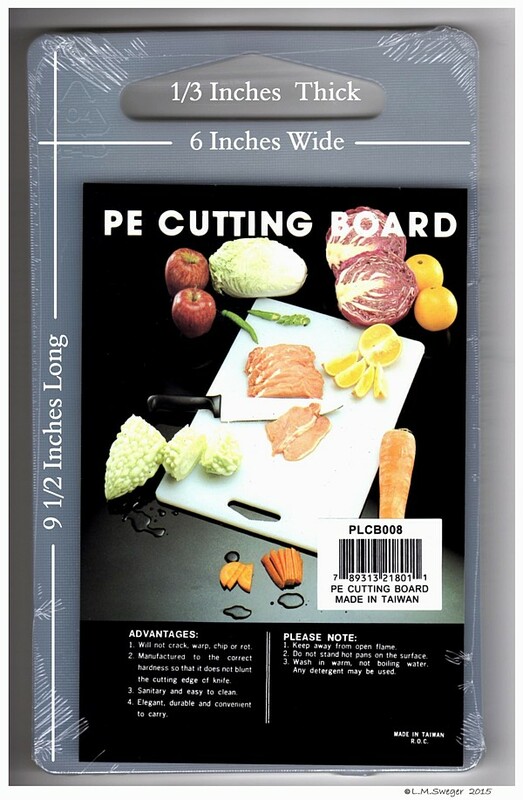 I found this Perfect Size at a Restaurant Supply Store. * * * * * *DO NOT use Wood, it will become Moldy. * * * * * *DO NOT use Metal, that will contaminate the Feed. 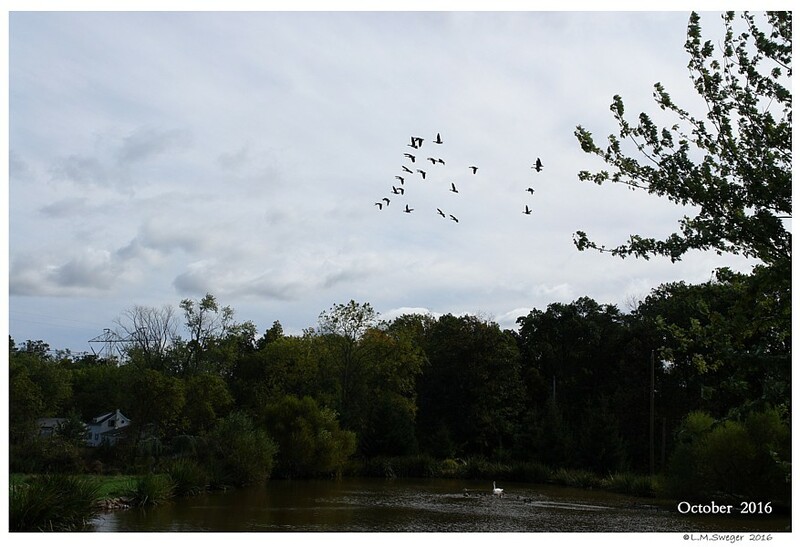 WaterFowl are very Sensitive to Metal Poisoning. It is BEST NOT to Fill the Container. Put enough in for maybe One-Two-Three Days at Most. 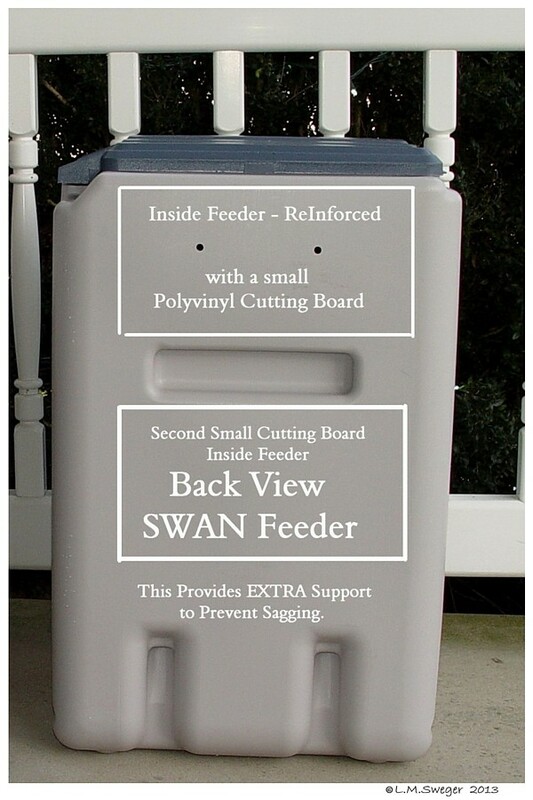 The Poly Vinyl Material is thin and the Container Sags if it is Filled. Try Half-way or Less and Adjust as you see fit. 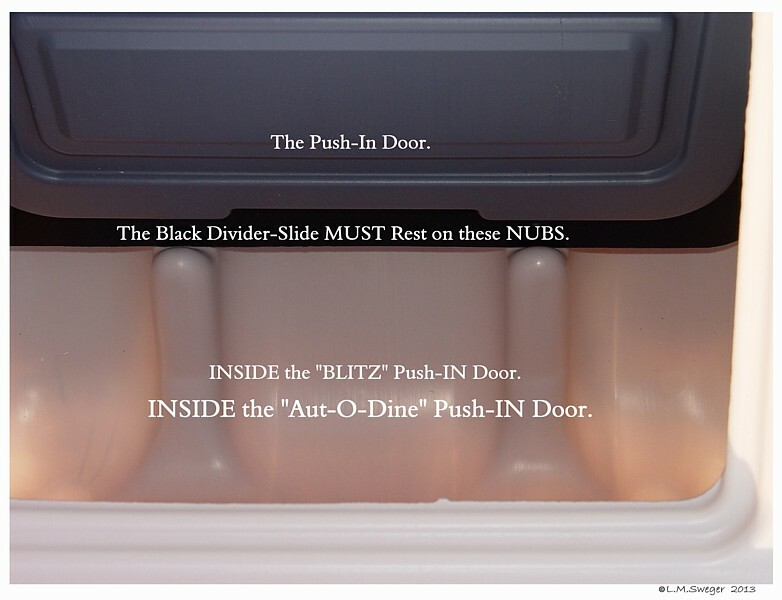 The Push Door has trouble – either NOT Opening..
OR, it Will NOT Close. 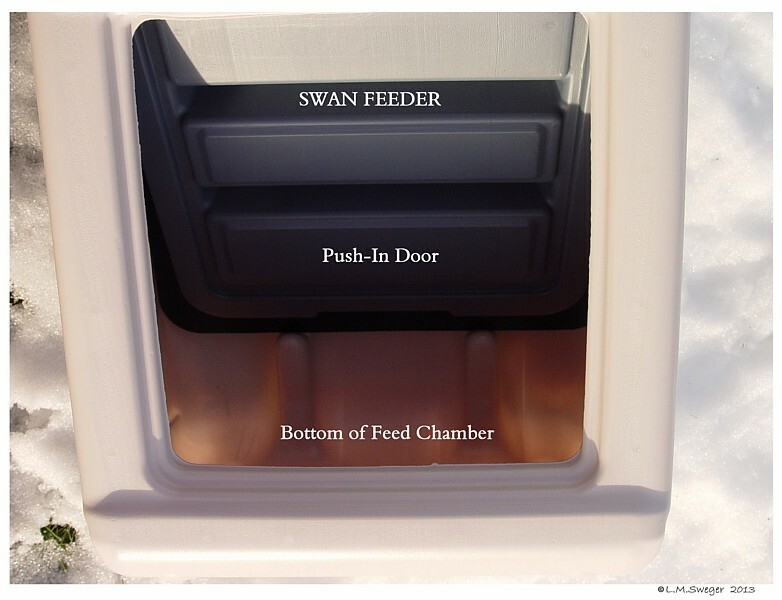 These Feeders were Designed for Dog Food to be in an Inside area. They Leak in many Places around the Lid and Into the Push Door. Clumped, Lumpy, Sour Smelling Feed.. DISCARD. 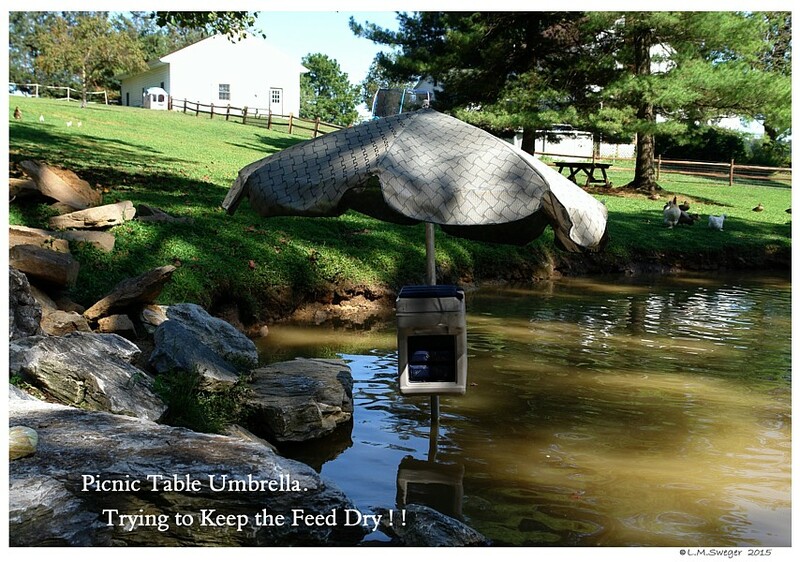 to try to keep the Feed from getting Wet. 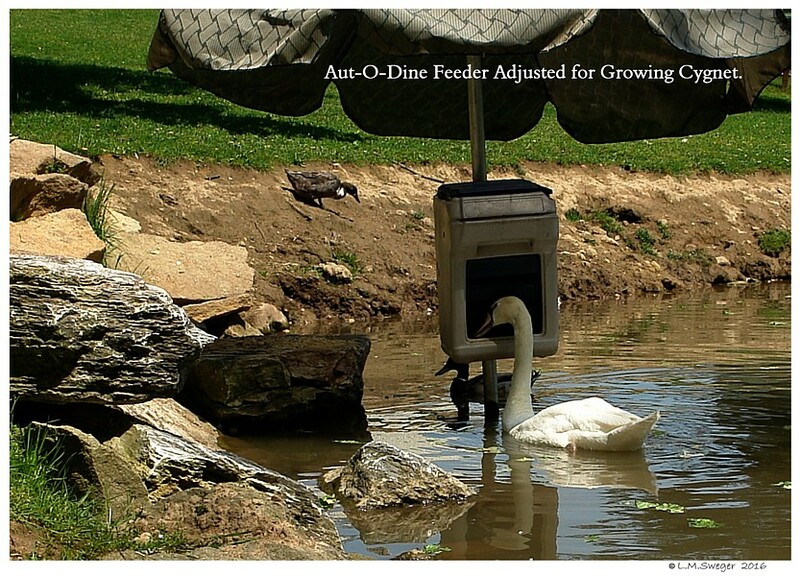 When you First Install-Mount an Aut-O-Dine 25 Feeder for your Swans, they may not know there is Feed inside. It is Helpful to Tuck Romaine Lettuce Leaves in the Push Door. The Sight of these Large Green Leafy Treats will Atract them. will be Watching and before Long it is being Used as you Planned. 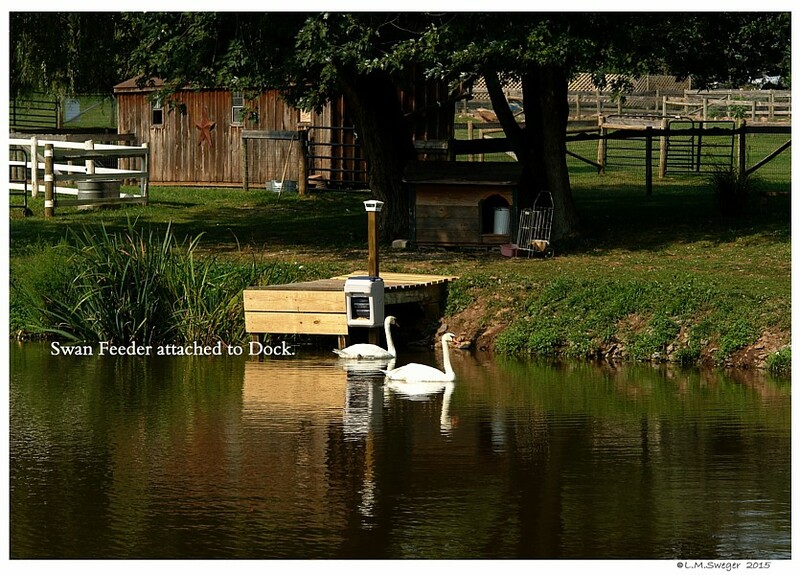 Watch to be Sure all your Swans are able to Reach the Feed. 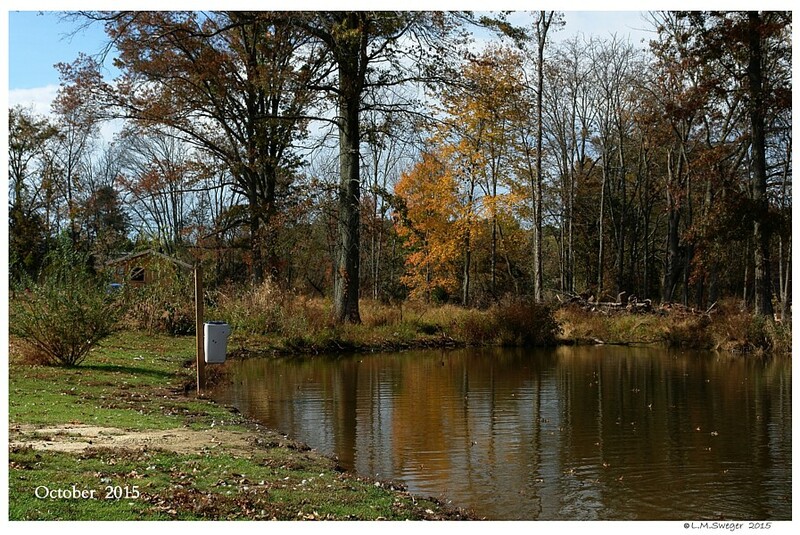 We like to Put a Mixture of Floating WaterFowl Pellets and Whole Dry Corn in these Feeders. 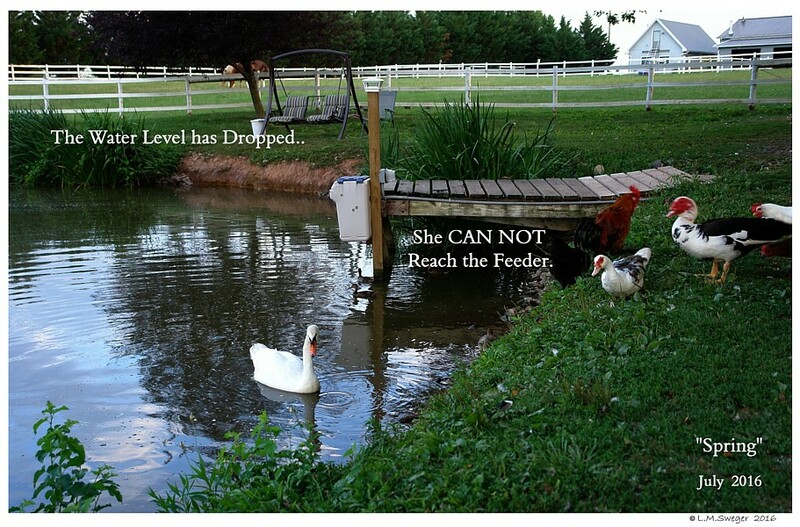 The Dropped Pellets Float… and the Dropped Corn will Soften. 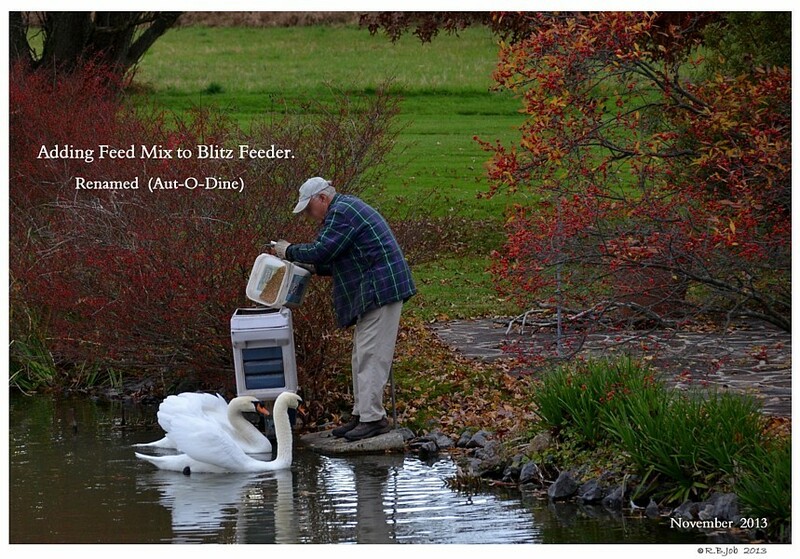 The Swans will get to Eat most of this Mixture.. Cute Little Ducks are Welcome to do the Clean-up. 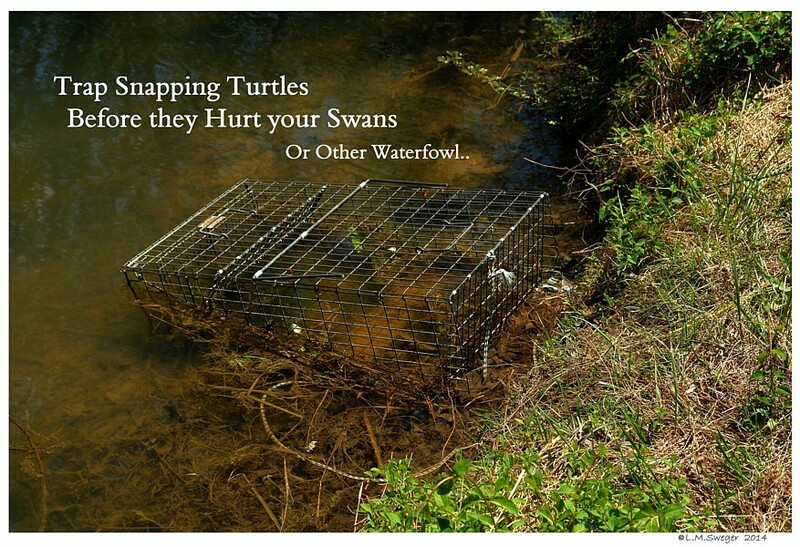 Snapping Turtle cause TERRIBLE Injuries to WaterFowl. 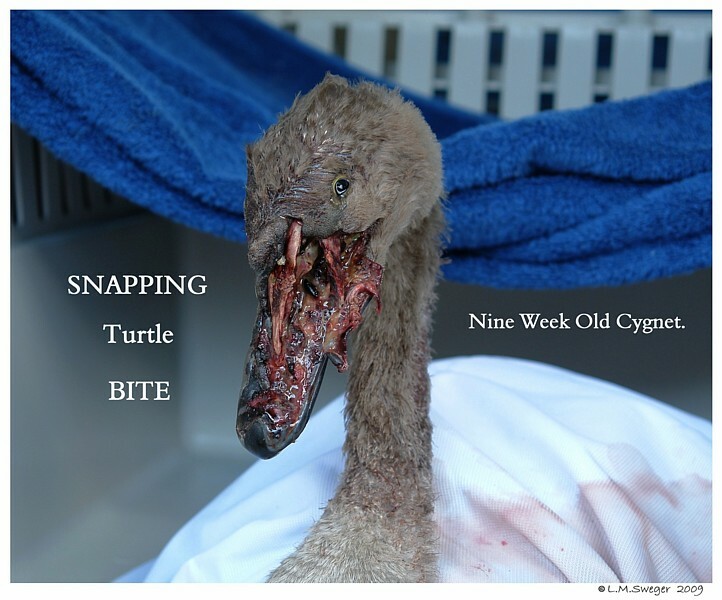 The Life of this Young Cygnet was Destroyed. Sadly Euthanized. Try to REMOVE any Snappers.. In any way you find Acceptable. YOU MAY have a Raccoon trying to get inside. 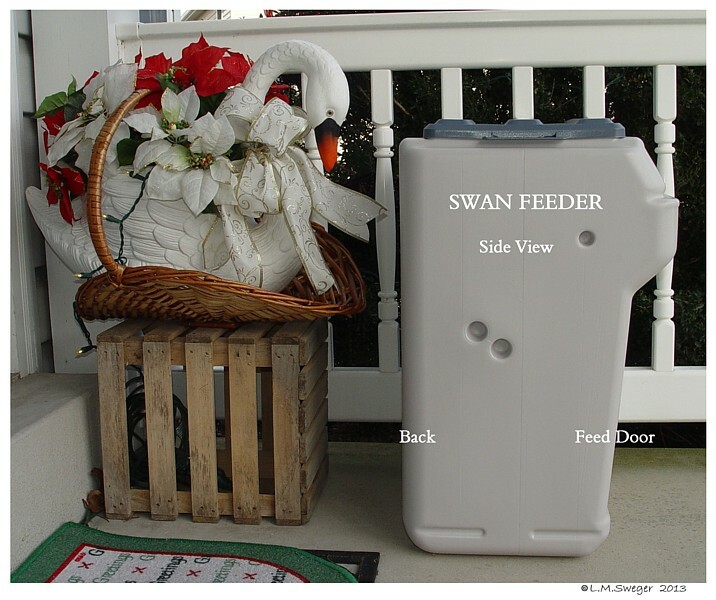 A Hungry Raccoon may Challenge your Swans for the Feed. 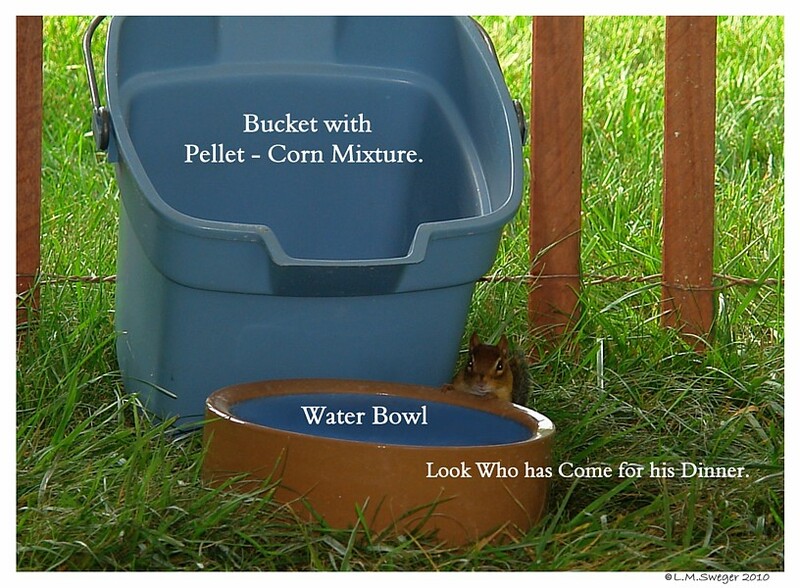 A Squirrel or Chipmunk may try Chewing into the Lid.. 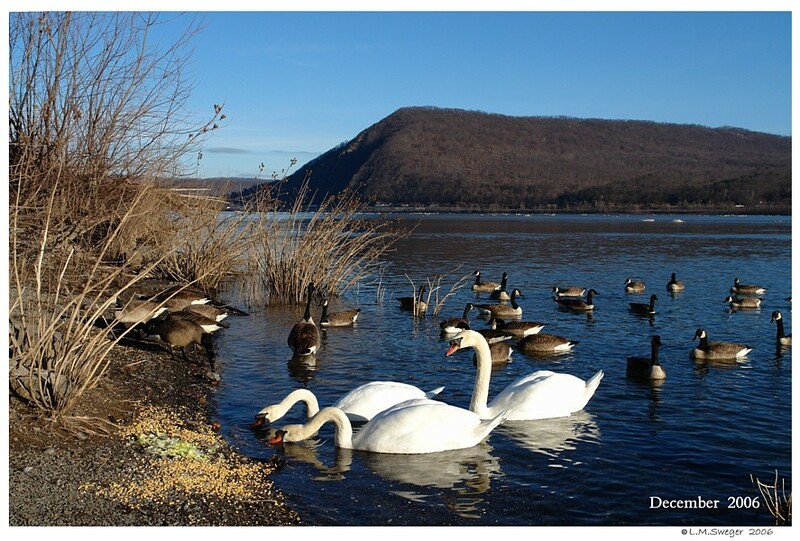 The Swans dip their Beak into the Water with each Bite. They get Dirty Pond Water into the Bottom of the Feed Tray Area. 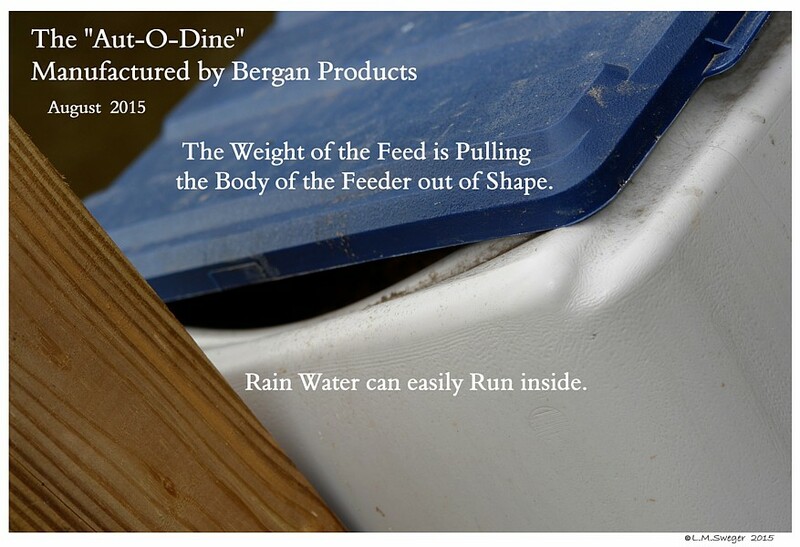 The Feed gets Wet and Spoils or becomes Caked Solid … or Freezes. Frequent Cleaning is needed to removed Nasty, Spoiled Feed. 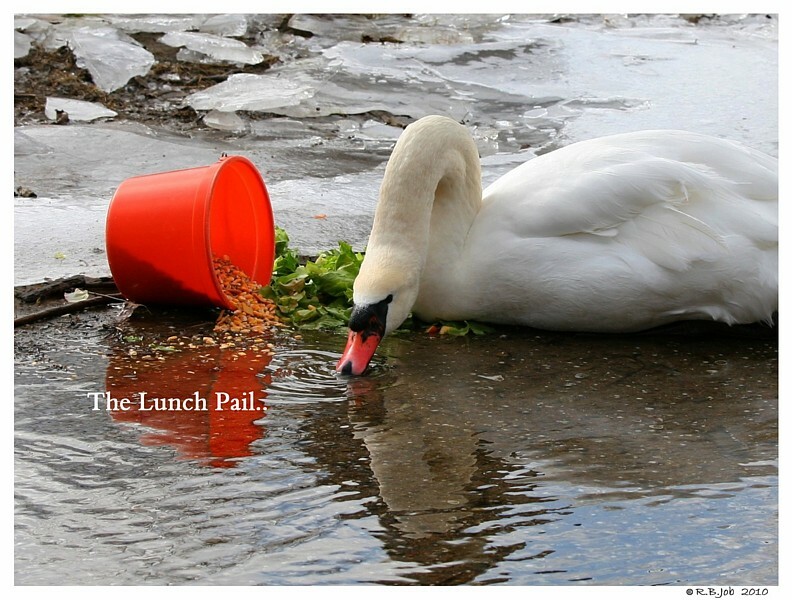 Soured Feed can make your Swans SICK.. 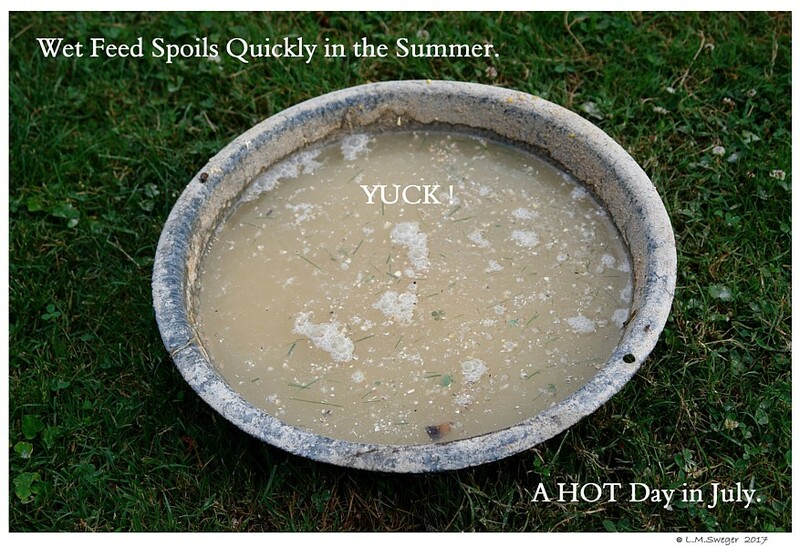 HOT Summer Days.. Insects may lay Eggs in the Soft Warm, Damp Feed. In Several Days there will be Maggots in the Feeder.. YUCK !!! 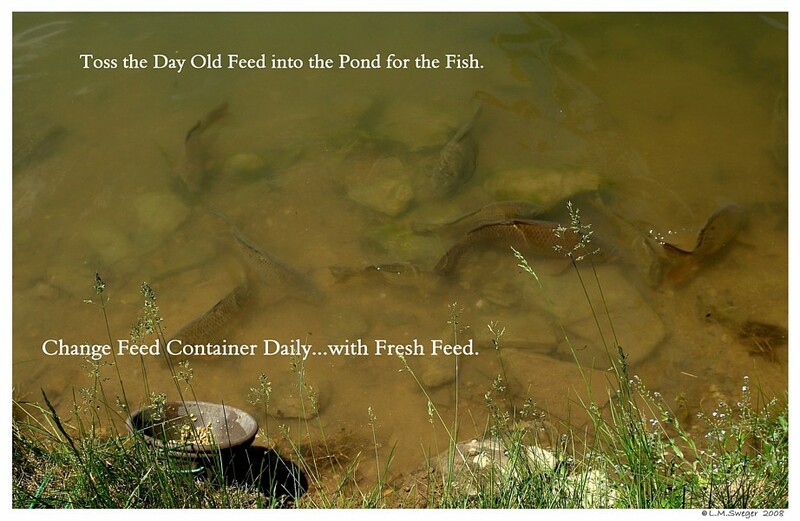 So, One or Two Days of Feed is most Practical. 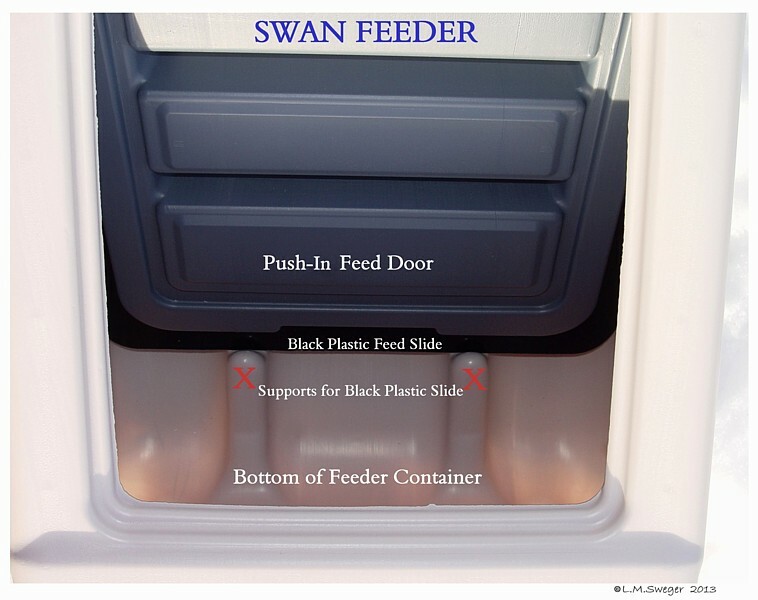 Check the Bottom inside the Push Door before you add Feed. 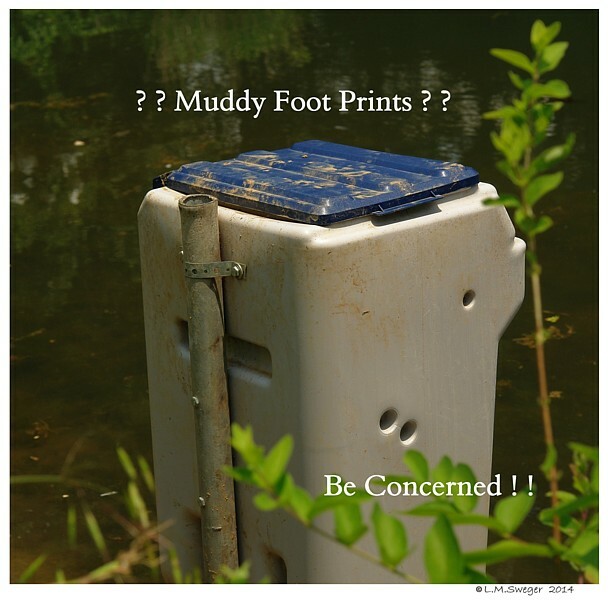 If it does get Lumpy-Wet-Smelly..
Toss that out into the Water for the Fish.. Or Discard-Toss Away..
ONE Thing we are trying is to put a Staggered Line of 1/4 Inch Holes in the Bottom of the Tray to allow Drainage and some Air to Dry this Area. This does not seem to make Much Differences. 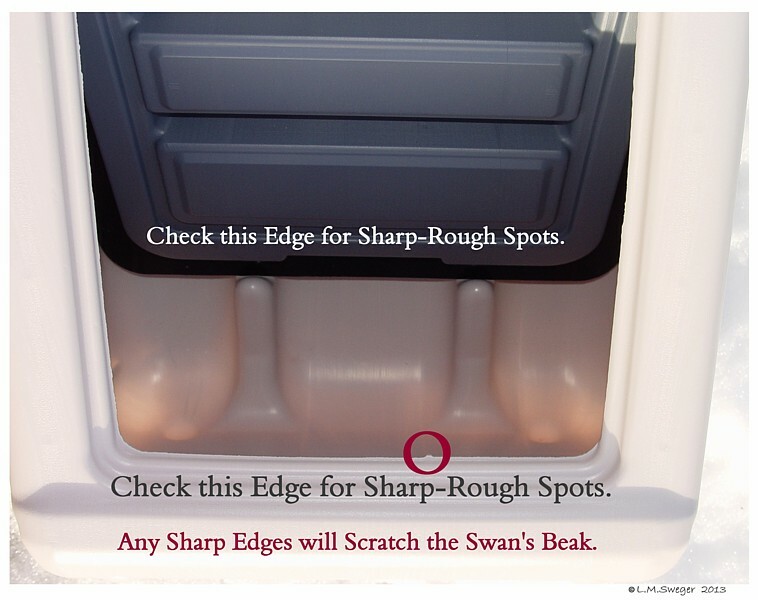 Make sure the Lid is “Snapped on Snug” after Filling. 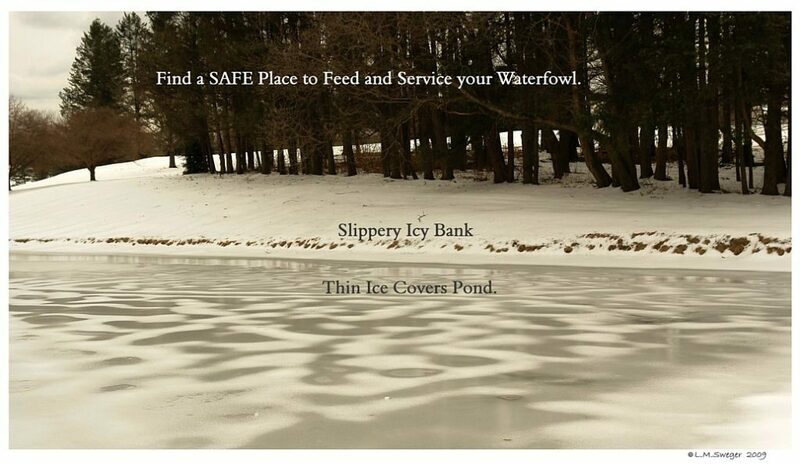 The Top/Lid comes off TOO Easily and can Blow Out into the Pond.. 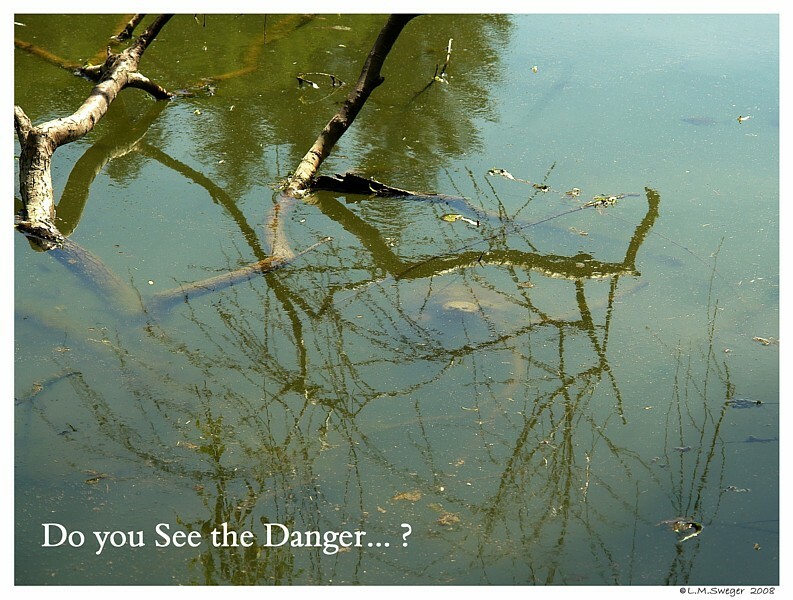 They seem to Sink out of Sight. There is NOTHING that Connects the Lid to the Unit. Consider some type of Attachment for the Lid. threaded through the Top and the Unit.. with Knots inside. 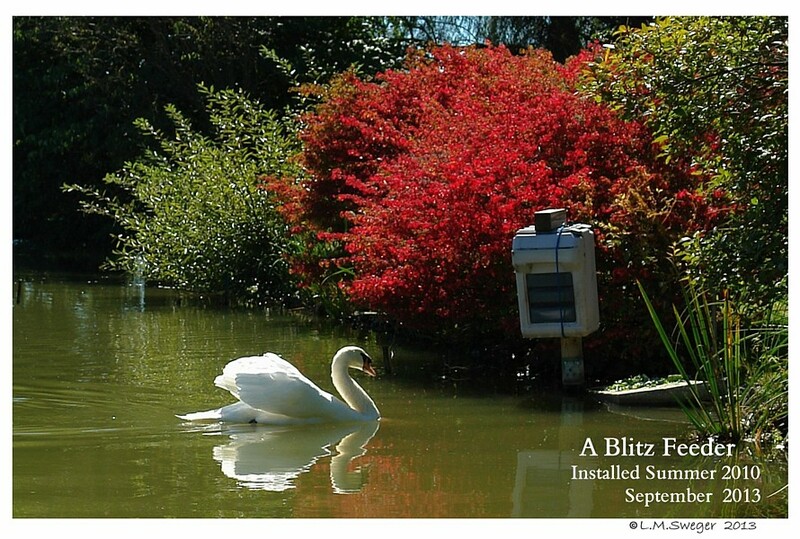 The Brick or Wood could fall on a Swan’s Head. 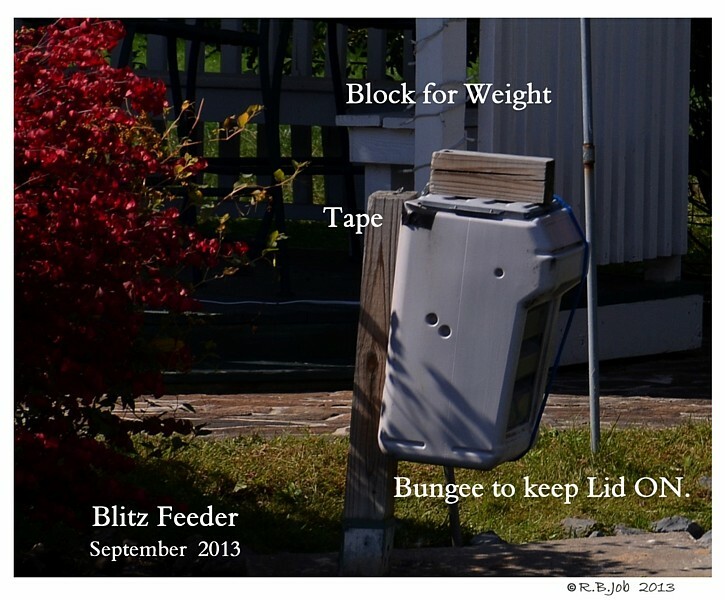 Bungees are Frequently Wrapped around the Entire Feeder-Lid. 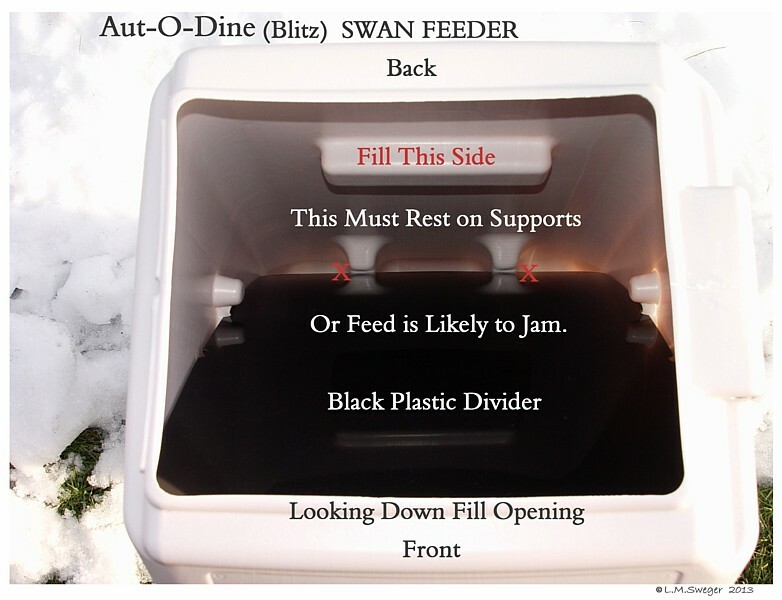 If the Lid is Lost during the First 12 Months..
Coastal Pet Products has been good about Replacing the Lid..
NO Longer Made by Bergan Pet Products..
(“BLITZ) – Aut-O-Dine 25 Feeder Used for Swans. 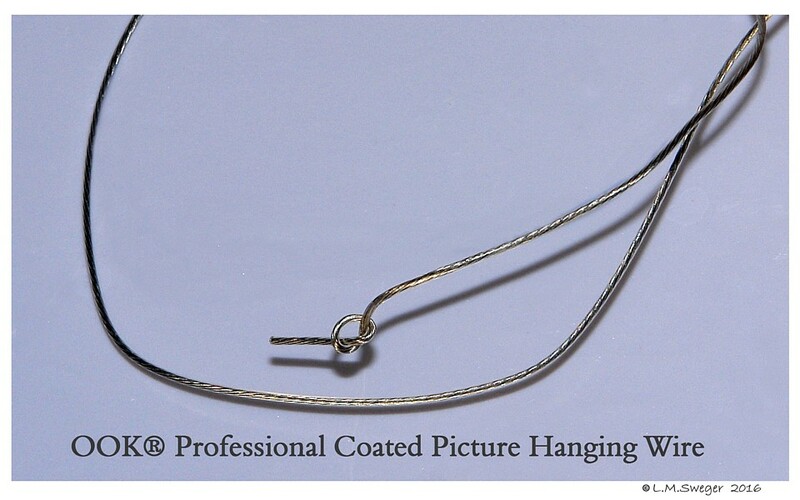 You can arrange for Replacement Parts through Coastal Pet Products. 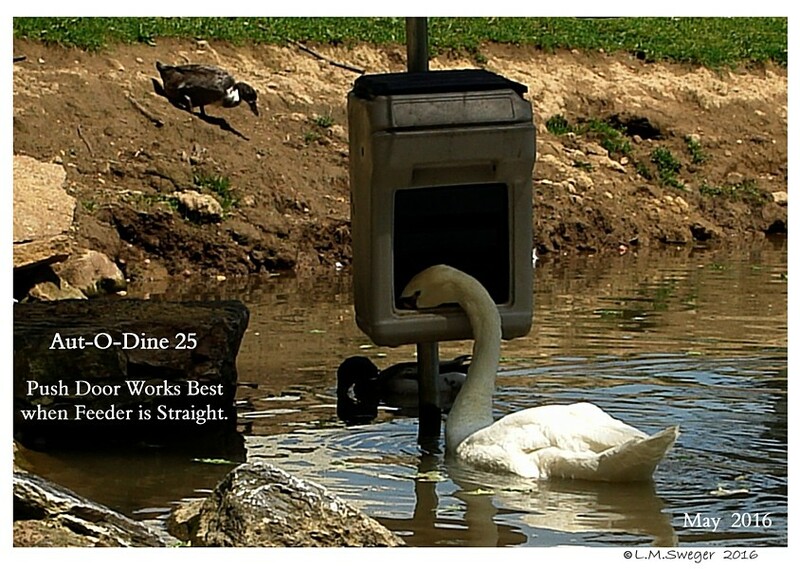 The Aut-O-Dine 25 can be found Online on various Websites. If Purchased from an ONLine Store… and Shipped. 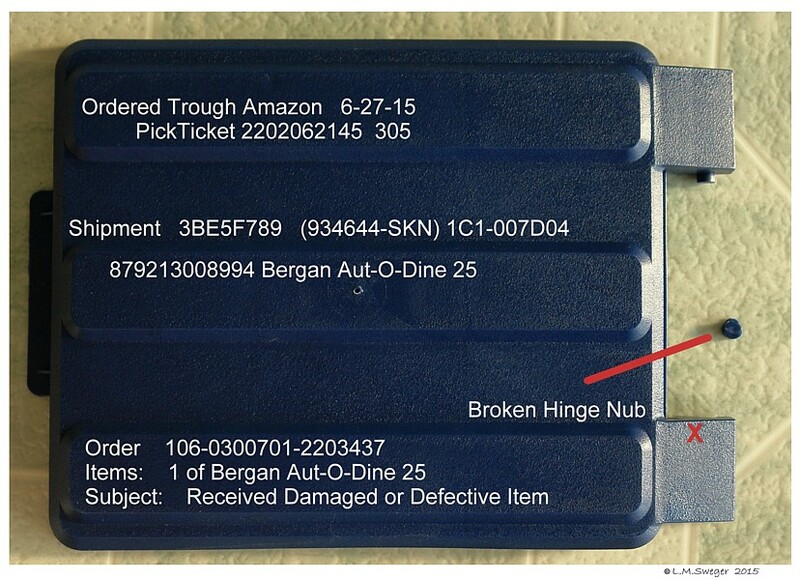 *** When the Box arrives Check the Unit for any Damage or Defects. We have receive Two Feeders that had broken Lids. I called the Manufacturer, sent Photo Images.. Both Lids were Replaced..
and they sent a Replacement -No Charge.. Warranty is One Year. 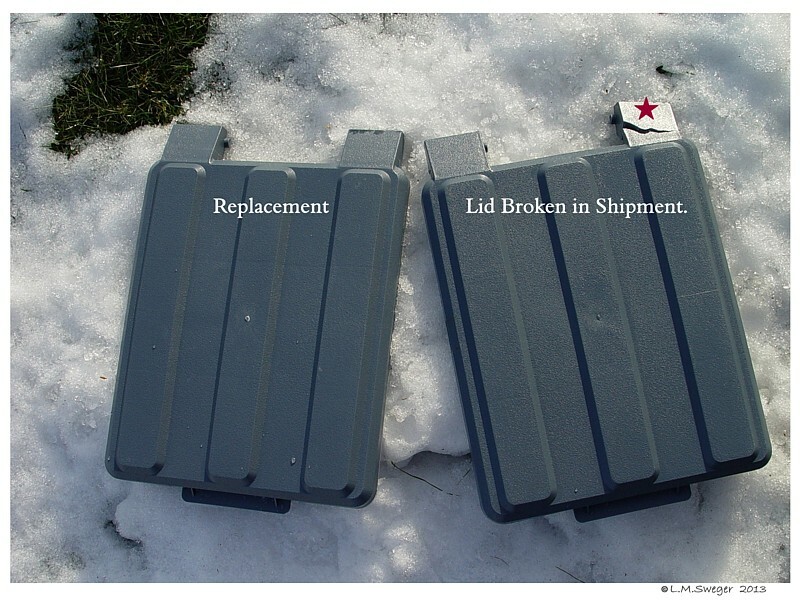 One Feeder was Crushed in Shipment and replaced NO Question. Our Tractor Supply has these (Dog) Feeders available. if it has defects or damage.. You may need to return it to that Store..
OR… first Call Coastal Pet Products, they may help you if the Unit was Damaged when you Opened the Box. Price Varies Year to Year. 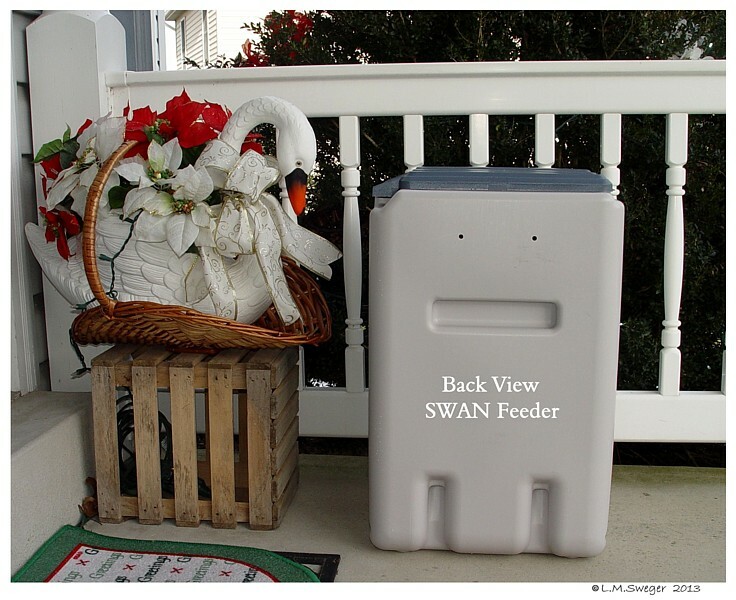 If you Find Ways to Improve the Function of this Feeder.. Please Share… We Learn from each other. If You have any Questions.. I will be Happy to Share Ideas..